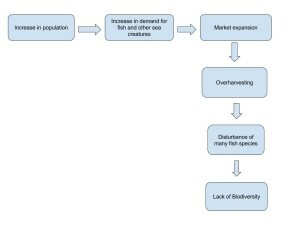 For this assignment, you will pick a topic to discuss about a biodiversity problem in the world and create a diagram that explains the reasons behind this issue. Step 1: pick a topic that relates to biodiversity and explain why it is important to our environment. The Amazon Rainforest is an example of a biodiversity issue occurring in the world today. This issue is serous because the rainforest is home to over 50% of global diversity. In addition, they help release oxygen to photosynthesis, which is helpful for many plant species. Many useful plants grow in these rainforests, and cutting them down will cause a decrease in these important plants. Clear-cutting and fragmentation are extremely destructive to our needs as humans because this causes us to lose beneficial plants that are useful to our everyday lives. The diagram I created explains a few of the many benefits and losses that occur when the rainforests are destroyed. When these rainforests are not being cut down and destroyed, they are providing many benefits that are important to the future well being of humans and the environment. They provide resources and crops, as well as health benefits and medicinal uses. On the other hand, when the rainforest are being destroyed, we are losing all of these crops that grown there, along with fresh air and the benefits that come from many of the plant species that are growing in the forests. It is important to provide an understanding of why these rainforests are so important to humans and the environment and what will happen if they are no longer around to benefit our future. 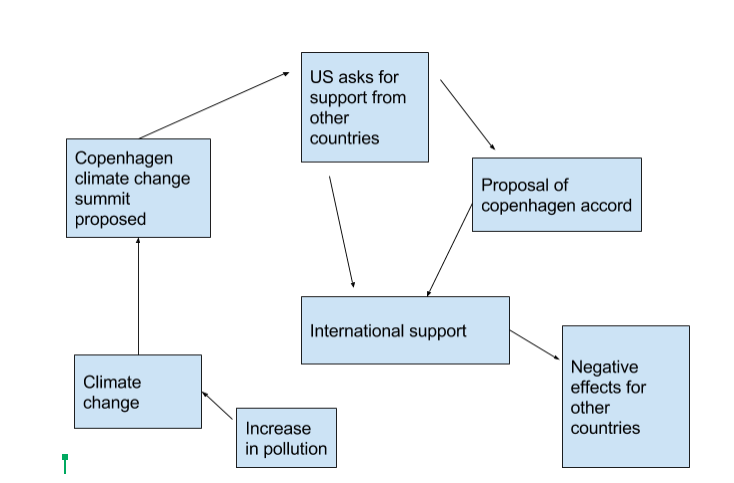 After reading about the Copenhagen accord, I created a diagram of the system in which the problems have started from and what they have created. It is evident that the main cause of the problems that are being face now are the climate changes that have occurred due to air pollution and increased emission from greenhouses. Once this evidently became a problem, the Copenhagen Climate Change Summit was created in 2009. The United States was in full support of this, which led to other countries also agreeing to support it as well. However, it took some bribing from the U.S. for the countries to agree because the Copenhagen Accord needed more countries to sign and support it. After bribing many other countries, 140 countries were in support of the Copenhagen Accord. This resulted in many changes in other countries, and fortunately for the United States, they could keep up with these changes due to the U.S. being a wealthy country. On the other hand, however, these other countries that cannot afford to adapt to these changes, are struggling in keeping up. The diagram explains how the air pollution was the beginning issue and how that resulted in climate changes that were affecting the area. In addition, that become the reason for why the Copenhagen Climate Change Summit was created. 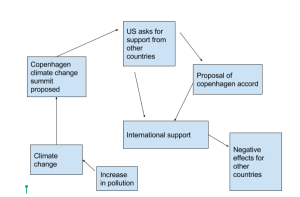 The diagram shows how there was an issue with the proposal, as there were not enough countries to support the cause. Which then results in the U.S bribing other countries for their support. Which did not end up helping these other countries, which is why there are still issues. In my opinion, the United States was being greedy when they bribed these other countries and I do not think what they did was trustworthy or respectful. It was a selfish decision made by the country and I think that what happened as a result was fair. The U.S. using the cables as a way to get the other countries to agree was not the right way to do it. This is why I do believe that the cable’s being leaked was right for what the United States did to the other countries. The issue could have been solved in a different way. Pollution is a problem with many countries in some way. The U.S used its economic and political power to take advantage of other countries, which is not a good way to deal with bigger problems that can be solved in other ways. In my hometown of Philadelphia, Pa does not face many natural hazards. There are no volcanoes or serious hazards that affect the area very much. The worst it gets is heavy rainfall and hurricanes, as well as occasional tornado warnings. I have lived here for all of my life before moving to state college and I have never felt that I was in danger while living in this area. The Nathan World Map of Natural Hazards does not do a precise job at showing specific points of the world. I think it is useful when researching hazards in broad parts of the world, but not in particular specific areas such as towns and cities. After viewing the Hungarian National Association of Radio Distress Signaling and Infocommunications’ Emergency and Disaster Information Service website, the disaster I chose was the tornado that occurred in Alabama. Fortunately, there have not been any tornados in my hometown for a long time. However, this natural disaster could definitely happen in my hometown at some point. There have been tornado warnings in Philadelphia, but nothing has seriously affected the area very badly. In addition, there have been tornados in my hometown and not very much damage was caused, which is why I do not believe there would be a lot of damage if one were to occur again. I also do not believe that this would be extremely harmful to human population in the area, because there are many precautions that are well known and can be taken into consideration once there is a tornado warning. There are not many natural disasters that occur in my hometown. However, in the past there have been severe rain and snowstorms that have caused many problems for the town. Hurricanes and heavy snowfall have affected the area numerous times in the past. The most common damage that has been caused is flooding, power outages and car accidents. When the roads become slippery from the snow and rain, it is common for car accidents to occur. In addition, flooding and power outages happen often because of the wind and the heavy snow or rainfall. I believe the best way to reduce vulnerability is to be aware of the problems in advance, and take action in creating a plan for when the storm occurs. People can find the right resources that will help from any destruction these storms may cause. My family had our basement checked for possibility of flooding before the storm came, to make sure that it would not happen to our house. This is a good idea for people to take into consideration so their homes do not get destroyed during the storms. In addition, having a back up generator is also an important thing to consider, because it is not certain when the power will come back on once it’s lost, which is a common effect that is caused by heavy storms. One year, my family lost power for over a week, due to a strong hurricane that hit our hometown. We did have generator, but it was not very strong so it only worked throughout a few rooms in the house. This was helpful, but we decided that next time we would need a stronger generator if our power would be out for longer than a week. In addition, construction workers could be helpful by making sure buildings and homes are in safe conditions to prepare for the storm. This assignment I am basing of, “Probing Question: What’s killing the honeybees?” by Lisa Duchene featured in Penn State News. Will other means of pollination allow for crop production to be sustained if there are further losses to the honeybee population? The honeybees may be the most influential step in the growing process. Farmers have always heavily relied on honeybees as a natural pollinator to pollinate all of the crops that feed families and communities. As honeybee numbers drop, other insects such as other species of bees, butterflies, and ants will continue to pollinate a certain percentage of crops grown and the increased amount of available food will increase the population of each of the species. (Fultz, 2009) The rapidness of this population growth and the full extent of crop amounts that can be covered is unknown. Butterflies and other replacement pollinating insects come with other complications that are not present with the use of bees. Butterflies’ offspring develop in stages away from a set colony. The caterpillar stage can be very harmful to crops. The caterpillar will eat large amounts of crops often in inconvenient places that harm the look of the crop which, as we covered in Module 6: Food and Agriculture, will hurt the sales of the crop. Due to the profound impact already being felt, farmers are purchasing and renting hives of honey bees to be places near the areas they are growing to ensure pollination rates. This task is becoming more difficult due to the decreasing winter survival rates of hives. The shortage is leading to importing of hives. The hives have to be transported which leads to higher prices. The fact that farmers are paying more and more money for single hives means that there is little alternative to using bees for pollination. This could mean a lack of food produced if the honeybee population continues to diminish. Is Translocation the Right Thing to Do for Maintaining Biodiversity in the Mojave Desert? My earliest encounter with efforts to maintain biodiversity came when I was a Marine stationed in 29 Palms, CA. The terrain on the base (the largest Marine Corps base in the world) was rugged and unforgiving for Marines. For the species that called the high Mojave Desert home, the environment was ideal. Ideal until the expansion of base activities and other off-road ventures by residents and visitors. I was a tank crewman and our company went on several field operation training missions monthly. We were provided with a wealth of information related to training safety and desert survival, but one part of our briefing that stood out were the instructions we were given on how to deal with the native Desert Tortoise population. The basic rule we were to observe was to avoid disrupting the creatures at all costs. I was able to see how seriously this rule was taken when a line of 20+ tanks stopped on a trail to the final training site because a Desert Tortoise had ventured into our intended path. We waited for well over an hour until the route was clear. Knowing how rigid our schedules were and how seriously our leaders took sticking to a strict timeline, it was apparent that protecting the tortoises was high priority – even higher than our routine training events. Part of our training in how to deal with the Desert Tortoise was a briefing that explained what would or could happen if we disturbed one of the reptiles. We were told that direct contact or near contact with a human would elicit a stress response in the tortoise that could cause it to empty its body of all of its water. This response would prove hazardous to the health of the tortoise and leave it vulnerable to attack for other indigenous predators. Years later, I saw a highlight of a professional golf event where a turtle of some kind had wandered onto the course during the tournament. Another player rushed over and grabbed the turtle and walked briskly off the course. While removing the animal, a stream of water began flowing from the rear of the shell. The broadcast crew, as well as the patrons, were amused at the sight but I remembered what I had learned about the Desert Tortoise and feared for its safety. The Desert Tortoise had been established as an endangered species in 1994 (shortly before I was stationed in 29 Palms). This designation was no doubt part of the reason for the serious effort by the Marine Corps to treat the tortoises delicately. Soon after the late-1990s, a plan was initiated to relocate the population of Desert Tortoises to a more remote location for conservation and maintenance of biodiversity in the region. This plan appeared to satisfy all parties involved: The tortoises would be spared the intrusion by Marines operating on the base, the Marines would be able to conduct their important exercises, and wildlife officials would have found an equitable solution to assuage their fears of extinction and the ramifications of a reduction in biodiversity in the Mojave. Experts, however, disagree on the efficacy of a translocation plan and conflicts have arisen with regards to the Marine Corps’ plan as well as other plans to build infrastructure for renewable energy facilities in the desert. The crux of the disagreement is in the viability of the displaced populations. 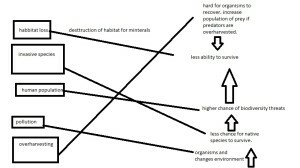 Concerns such as disruption to social compacts, disorientation in terms of resources the tortoises need for survival (water, shelter), and the spreading of disease from one specific species to others. Recent data has shown that the fears of conservationists who were against translocation proved warranted. From 2004-2014, a similar relocation project transplanted 9,136 tortoises from Las Vegas to a nearby federal translocation site. Only 370 of those relocated could be located for review in 2015. It is apparent that a hasty plan to remove the animals and relocate them elsewhere serves the interests of the human population (military, recreation, renewable energy plants) but does not adequately address the needs of the Desert Tortoise and the overall biodiversity of the region. The article describes several aspects of the biosphere that would be in danger of creating loss of biodiversity, including human life. Water is a big part of the climate change affects. Climate change affects rainfall which could affect droughts as well as flooding in various parts of Africa. These phenomenon could put drinking water strains on a population that already has a population that is under-nourished. Sea-level changes have also been noted and if they continue could affect coastal areas with large populations and endanger their lives. According to the fact sheet produced ecosystems are critical in Africa, “contributing significantly to biodiversity and human well-being. Between 25 and 40% of mammal species in national parks in sub-Saharan Africa will become endangered.” This loss of biodiversity could adversely affect the human population by reducing resources and putting a strains on population survival. The World Bank reported that by 2030 nearly 90million people in African will be exposed to malaria. If this disease or other diseases is combined with the phenomenon above, the African people face imminent danger. 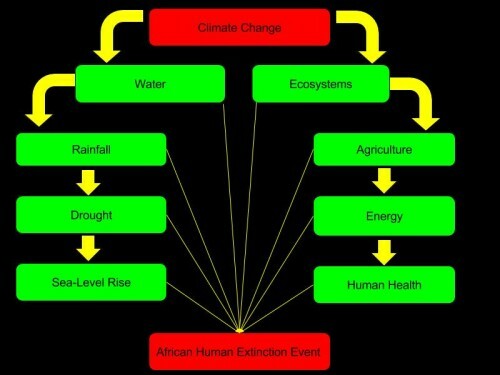 The System Diagram above describes the hypothesized African Human Extinction Event. The source of such an event, is described in detail by the United Nations Environment Programme (UNEP.) UNEP predicts that current levels of climate change are affecting the African continent the most of any continent and that the African population is the most endangered human population due to climate change. The Diagram shows climate change as the main source topic at the top. The red boxes above show the main topics, or how we get from A to B. The green boxes are the adversely affected areas of the biosphere, that could lead to a human extinction event on the continent of Africa. The arrows are in yellow to describe caution, as all of the effects shown here, happen to have negative effects. 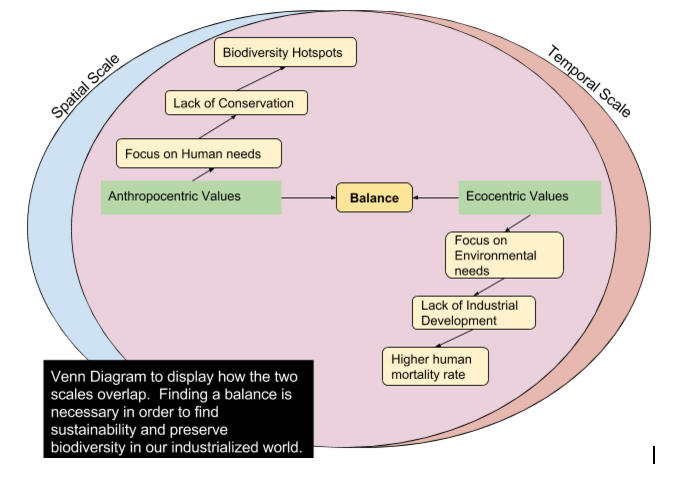 Part One: Draw on the lecture to create a system diagram that shows how humans impact biodiversity and vice versa. Part Two: In 250-300 words explain your system diagram. This diagram shows how biodiversity and humans are interrelated. Each affects the other in various ways that I tried to capture. I also attempted to show that there are different lenses though which one can examine the interaction. 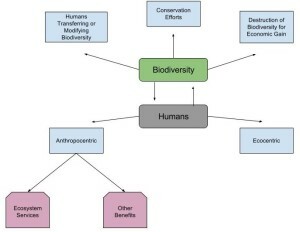 To start I have an arrow pointing from biodiversity to humans. This signifies that biodiversity impacts humans and the arrow in the opposite indicates the same, only for humans. Biodiversity impacts humans first through an anthropocentric view. This is further broken down into ecosystem services, which include all of the quality of life benefits we receive such as clean air, water, replenishing soil and maintaining a proper heat balance in the atmosphere. The other uses are more economic and provide a more tangible benefit. For example biodiversity provides us with medicines, food, recreation and scientific information. On the other branch we have the ecocentric branch. Humans don’t really receive anything in this view, but we understand that biodiversity has an intrinsic value and a right to exist. In the other direction, from humans to biodiversity, I have three main categories. The first category signifies that humans have impacted biodiversity through movement and migration. Also, that we have affected it through selective breeding in agriculture. Conservation efforts can stem from both ecocentric and anthropocentric views, but the point is that humans realize the need for biodiversity and affect it through conservation. Lastly, I have destruction of biodiversity for economic gain. I think this is the largest impact that humans have had on biodiversity. Throughout time we have chosen our needs over the needs of the environment, which has harmed biodiversity. This trend continues to this day and is a complicated issue to solve. Part Three: In 325-350 compare and contrast the deforestation in the U.S. and the deforestation in the Amazon. Examine the reasons for the deforestation and consider the ethical implications. What should be done? There are many reason for the deforestation in the Amazonian forest. For starters the government incentivizes this deforestation through a combination of tax breaks and subsidies. The Amazon also suffers because of clear-cutting for cattle, subsistence farming, commercial agriculture and logging (Lind). The commonality between all of these activities is that they benefit people by providing economic opportunities. This poses an ethical question and a choice between people or the environment. The same situation took place in the U.S. as we learned within the lecture. The U.S. chose people over the environment as nearly all of our virgin forests have been clear-cut. Many of the governmental policies between Brazil and the U.S. are also very similar. For example the U.S. provides subsidies to farmers and the agriculture industry enjoys substantial property tax breaks. We also destroyed our forests for economic gain through logging, agriculture, and other activities that contributed to economic development. The essential question is how can we as a nation ask other countries to protect their biodiversity when we destroyed ours? The U.S. gained so much in economic terms through the exploitation of our natural resources. It’s unjust of us to expect people of other nations to forgo economic development in favor of biodiversity. This is similar to the conflict we examined within the climate change module. In the climate change module the developed nations benefited from exploiting fossil fuels, while less-developed nations are just beginning to reap the benefits. Once again it’s unfair of us to expect them to give up their economic development. I think the only course of action is for developed nations to contribute to a worldwide fund. This fund would be used to fund sustainable investments in nations where biodiversity is threatened. The purpose of the fund would be to provide economic opportunity to locals, while protecting the forests. Providing an alternative source of income is one of the best ways to discourage deforestation, while also benefiting the local population. Lind, Derick. 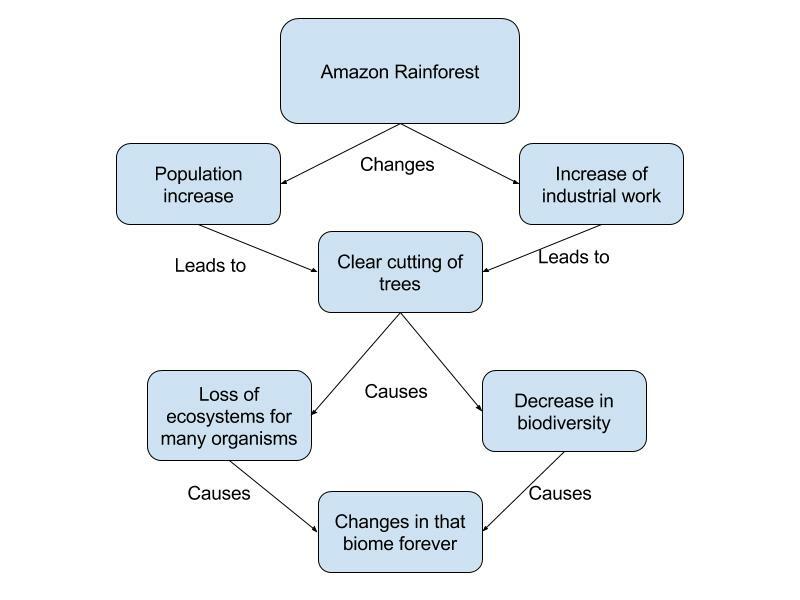 “Impacts and Causes of Deforestation in the Amazon Basin.” Impacts and Causes of Deforestation in the Amazon Basin. Kanat, 6 May 2010. Web. 21 Apr. 2016. Dubai, a quickly growing city in the United Arab Emirates, is well known for its biggest, largest, and tallest attractions. In 2001, Nakheel properties began constructing the famous Palm Jumeirah Islands. These islands were constructed using land reclamation, which requires heavy earth moving. This construction heavily impacted the Persian Gulf’s marine environment, forcing such change on waters altered many things from coral area shifts, to biodiverse confusion. These land shifts altered wave sizes, which played a heavier role than many think, which also led to migrations of animals to different areas, which can induce invasive species. Ethics comes to play when we ask ourselves if tourist attractions like these are really worth the environmental impact that comes attached to them. As Dubai continues to innovate interesting ways to keep tourism as high as is it, environmental impacts are not nearly as much of a concern as they should be. A decline in the world’s bee population has began to already show its effects as they are nature’s pollinator.There has already been a 40% loss in commercialized honeybee in the US since 2006. The main influence in this statistics is the growth of insecticide usage across the agricultural industry. Asides from pesticide usage, the bee population has also been influenced by parasites, pathogens, herbicide, industrial practices, and climate change. Some estimates range from 50-80% of the world’s food supply being directly or indirectly affected by honey bee pollination. Whether it’s pollination of apples, or pollination of the seeds used to produce grain for livestock, the food chain is linked to honey bees. The world’s production of food is dependent on pollination provided by honey bees. I believe the world doesn’t completely understand how heavy the bees’ influence is and I often think most of us won’t until the damage is irreversible. This week’s assignment was inspired by a TED Talk that I recently watched, about Bhutan discussing the nation and climate change. Bhutan is a small country in Asia that has promised and is making the commitment to remain carbon neutral. 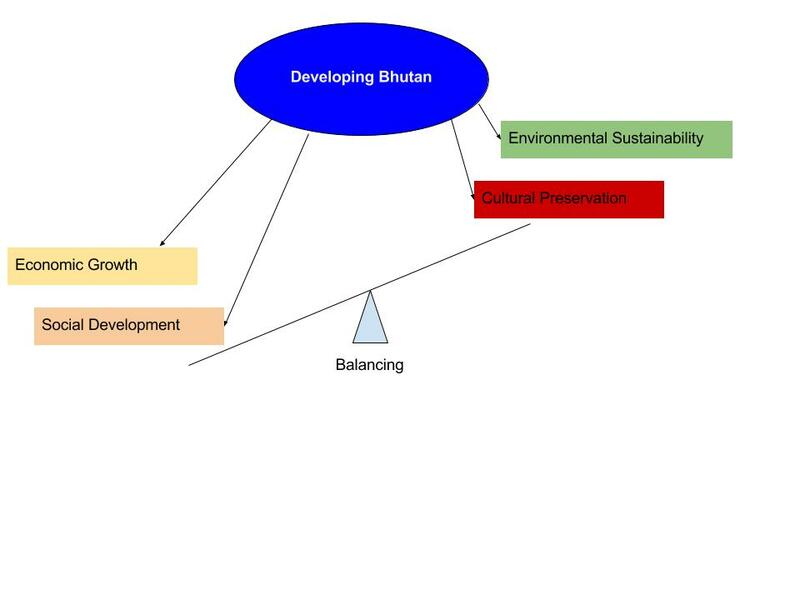 The above diagram gives a few hints on how Bhutan, this small underdeveloped country is dedicated on remaining carbon negative. Please check out the video in the link below. As I watched this video, I was instantly captivated by Tobgay Tshering’s presentation about Bhutan. In this short twenty minute video, a great synopsis of Bhutan is clearly portrayed. Bhutan located on the Himalayas between India and China has a population of about 700,000. What was most fascinating about the TED Talk is that currently Bhutan has a holistic and balanced approach to development that is driven and maintained by the government. What is holistic development? It is right balance between equitable and sustainable livelihood, ecological conservation, good governance and a thriving culture. The Gross National Happiness, now a revolutionary initiative was proposed and implemented back in the seventies by Bhutan’s former emperor. GNH promotes harmony and connectedness with nature amongst the people. As a result, collectively as a nation Bhutan has kept its pristine forests that currently covers 72% of its land mass. In addition, the constitution has put into effect a policy which demands that 60% of Bhutan’s total land mass shall be maintained under forest cover. How does Bhutan manage to be carbon negative? The entire country generates about to 2.2 tons of CO2 which they offset is various ways. To begin with, they give free electricity to rural farmers, hence limit the use of firewood. The government invests in sustainable transportation by subsidizing the purchase of electric vehicles. Also subsidies of LED lights as well as programs that focus on planting trees and cleaning up the country are prevalent. Ultimately, it is the forest cover which absorbs about 6.8 million tons of CO2, thus making Bhutan carbon negative. How does Bhutan compare with my hometown? One of the key drivers of Bhutan’s edge and success with commitments to making a difference in climate change comes down to leadership / governance. Bhutan’s innovative governance that began in the seventies has set the path that some nations recently began adopting, for which here in the US there is still some catching up to do. In my community, Falls Church, a Washington DC suburb, the Gross National Happiness or holistic development isn’t the government’s main focus. 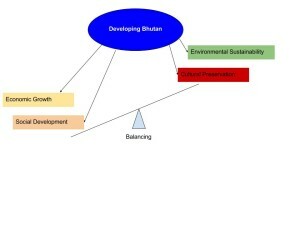 Neither is government / leadership steering widespread sustainability programs such as the standards supported in Bhutan. Campaigns like tree planting, sustainable development, regulating greenhouse gas emissions, pushing subsides for purchases of electric cars should be headed by government. Even so, sustainability is a collective action, therefore the communities and government need to come together to put into effect and accomplish these initiatives. There are some advancements towards sustainability and reducing carbon footprint that the Falls Church community could drive. Planting trees, preserving the little greenery that is left in the county and cleaning up the community are simple initiatives that can easily be jump started. Needless to say there are a few US cities that making strides towards sustainability, now it’s up to the rest of us to come together collectively and take action. Looking at figure 10.1 the map of Biodiversity hotspots, choose one of the hotspots and research it. Describe the hotspot you would like to visit. Name some of the plants and animals that interest you. Some of the resources you may use from that region. Talk about some of the greatest threats to your hotspots biodiversity. For my hotspot I chose the Tropical Andes. The Tropical Andes which is one of the most biologically diverse region in the entire world in large part to the vast amount of different micro habitats in the mountainous region. Plant wise this region is home to about 10% of all the worlds species, and 50- 60% of the plants found here cannot be found anywhere else on earth. It is also the center of origin for some of the worlds most important crops such as potatoes and tobacco. This region is also home to almost 980 species of amphibians including one of my favorite the poison dart frogs whose venom has been used for a wide variety of medical uses by humans. some of the greatest threats to the biodiversity of this region are deforestation, mining, road building, and dams are all major contributors to loss of biodiversity in this region. As said previously the fact that 50-60% of the plants in this region are not found anywhere else in the world really raises concern for their loss as there are no alternatives, especially if these plants provide uses for humans such as medicines or food. 2. 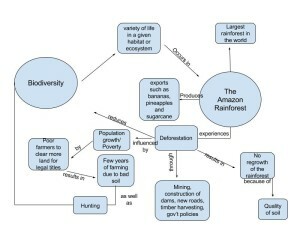 From this lesson Look at the Case Study: The Amazon Rainforest. Try to connect one or more of the previous lessons to some of the issues described in this case study 150-250 words. The first lesson I think is important to connect is climate change and it connection to the deforestation of our rainforest. As described our rainforest are essentially the filters of CO2 in our atmosphere as they plants in these regions remove it and use it in photosynthesis. As we destroy more and more of our rainforest we are losing our essential buffer systems that keep our CO2 levels in check. With increasing industrialization these systems are more critical than ever. Another lesson is urban planning. As large cities continue to expand in this region we could see the impact of industrialization reduced with proper planning. blending the expanding areas with the current forest instead of clear cutting can reduce impacts on the environment and loss of habitat. Also making things such as walker or biker friendly neighborhoods could reduce street size and thus the needed are for development. Also these neighborhoods would reduce CO2 emissions. 3. Finally throughout this class we have learned about the impacts humans have on our environment. Briefly describe some of the most important lessons you have learned in this course and why they matter to you. I think one of the most important lessons to me was the lesson on climate change. Particularly in this lesson the amount of statistical data that disproved my previous stance that climate change isn’t caused by humans it is cause by the earths natural cycles. While this may have some truth the evidence provided has shown that both CO2 levels, temperature shifts, and destruction of climate sensitive habitats have all been shown to correlate with the industrialization of human populations. Lastly i would have to say the Biodiversity lesson does a great job in ending and posing the question about us as humans. We constantly ask ourselves what are we as humans affecting but rarely look at the effects our action have on ourselves. We have been blessed to live in a period on earth in which has been very stable and allowed the human population to grow and thrive. The fact is that stability cannot last forever and we really have to pose the question what will happen when it does. I think this question really affects me because I see myself as a part of the whole process and I want it to remain stable for as long as possible. I need to improve my individual actions that will go towards helping the planet not hurting it. I also need to show support of collective actions that will go towards ensuring a better more sustainable earth tomorrow. Name a country you’ve visited outside the US, or one that you really want to visit. First paragraph, explain where it is, then in 200-350 words describe the differences in ethical views there and here. Second paragraph, explain the difference in the urban planning and development. Touch on topics such as, the public transportation system, and business development. Part 2—Design a systems diagram indicating how why there are differences between the two nations. I’d like to speak on my birth country, Bangladesh. Although I left Bangladesh at a very young age, I did visit when I was a little older to remember how it is. From the moment you step off of the plane, you can tell the difference immediately. It is complete opposite of what we are used to here in the states. Bangladesh is located in South Asia to the north western region of India. The lifestyle there is completely different as the people there still hold on to their ancient traditions to the best as they can. From the moment I stepped out of the airport, I felt like a complete outsider, as I was not used to the way of living there. If we think we see a lot of homeless people downtown, you have no idea how many there are back there. It truly broke my heart to see so many disabled children wondering the streets begging for money. Ethically speaking, you most probably wouldn’t see that here in America. Something would be done to shelter these people so they didn’t have to suffer in the streets. Back there, people walk by and don’t even bat an eyelash. I’ve even witnessed a poor child being kicked by someone just because they were sleeping on the side of a road and the person walking didn’t see them so they tripped over the child. It was obviously the adults fault for not watching where he was walking, but the poor child still got beat and not one single person did anything to stop it. We all know that kind of behavior just wouldn’t be tolerated here. This experience of mine is by no means an attempt to slander the citizens of Bangladesh. There are many kind people that are fighting to help the poverty, but with so many homeless people, there’s little they can do. My main point I was making here is that our ethical views are just different. The capital city of Dhaka can be compared to New York City as far as the hustle and bustle part of it is concerned. With businesses on just about every corner, it’s a very popular and extremely busy place. With so many people trying to get around, it is believed by many that walking or bicycling is a better mean of transportation. I myself have been stuck in traffic in a car for two hours for a 5 mile commute. It’s truly ridiculous. The roads aren’t just filled with cars and busses that we’re use to here. They have other means of public transportations as well for cheaper rates known as rikshaws and auto-rickshaws. A rickshaw is basically a big tricycle with a seat for 2 in the back, although it is very likelt you’ll find 3 or even 4 sometimes to a cart. The auto-rikshaw is basically the same thing, but can travel faster since it has a motor attached to it. Due to so many of these, and horrible traffic control, the roads are constantly congested. My diagram is trying to illustrate the differences in lifestyle and ethical between Bangladesh and America. As you can see the first distinction I am attempting to make is the level of education. I personally believe that this stems to the greater problem in Bangladesh. The lack of education leads to more poverty, also leads to the way of thinking. I put the two countries name side by side and have arrows coming out from them indicating the differences. Using outside sources, research and find studies of biodiversity in or near your hometown. Briefly describe the study, its purpose and problems that are being found in relation to H.I.P.P.O. Union County, New Jersey is home to many concerned citizens as well as a county owned stretch of the Passaic River. Over the course of 24 hours in 2011, scientists and biologists were to experiment with the river. The experiment’s main goal was to release the true facts about what lives in the river. The plan is that over the course of these 24 hours, the scientists will shock the water with electricity in order to temporarily stun the fish and let them float to the top of the water. By doing this the scientists and community citizens will get to truly see what has moved into their area which will give them a better idea of how to maintain the waterways. The concern is that various foreign species have made their way into the area by local ports accepting imports and unknowingly bringing their own species into the area. Scientists claim it is truly sad the unknowing impact that these importers have and that it truly effects their ecosystem. The Pinelands in New Jersey is home to the Northeast’s largest pinelands with almost 1500 square miles. 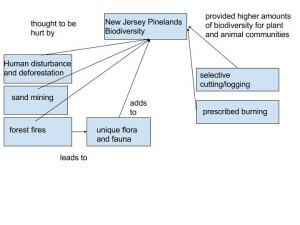 The plan of this study was to analyze the impacts of the forest management services. The would be one area that was strictly designated as a control zone that has never had any forest management as well as a test zone with history of forest management that would serve to prove whether or not the forest management did or did not impact the overall biodiversity of the area. The study areas were vegetation surveys and avian surveys, or also referred to as bird and plant studies, respectively. The overall findings of these studies were that the forest management and human interaction in these areas did, indeed have an impact. The forest management zone had impacts of life lengths of plants as well as the increased number of non-native species due to the interaction of the humans in a place they simply do not belong. 2. Using the Pinelands study, create a diagram that shows the threats to biodiversity in the New Jersey Pinelands. 1.Question 1 (In 250 words): Are dense anthropocentric developments as resilient/adaptive to major change as their counterparts? Simply put, for a variety of reasons with the most influential being economical, urban metropolises aren’t as adaptive to major “change” as ecosystems are. Especially in this modern age with a sprawling human population, the effects of this deficiency become all the more pronounced when disasters do happen. Many times when such events occur a state of emergency is declared (not trying to debate the merits of such a declaration) and external aide is quickly provided. City plans are designed on the premise that all if not a majority of the needs or services a city requires will be delivered to it rather than addressed “in house.” This type of perspective means that little if any thought goes into adequately designing space to maximize the various utilities a space may have to offer(whether vertical, on the ground, etc…). Vital services include waste management, energy generation, efficient heating/cooling biomimicry among others that can be tackled in many ways depending on the topography throughout the city. For example, a city’s skyline is usually dominated by the all too familiar block-like skyscrapers that during a heat wave can’t alleviate the increased heat efficiently without added strain on the power lines. The aggregate demand of such a scenario in addition to any unforeseen natural disasters could lead to serious issues. While most skyscrapers are constructed in a manner that minimizes costs, the city collectively would benefit from skyscrapers that mimic biology in design and function. (Such arrangements= increased weight savings, less materials needed, more sunlight exposure, better deflection of heat, etc…) Lastly, a cities’ reliance on external support means it’s prone to abrupt disruptions more so than an ecosystem because an ecosystem’s biodiversity allows for a greater carrying capacity and resiliency(=greater margin of error). 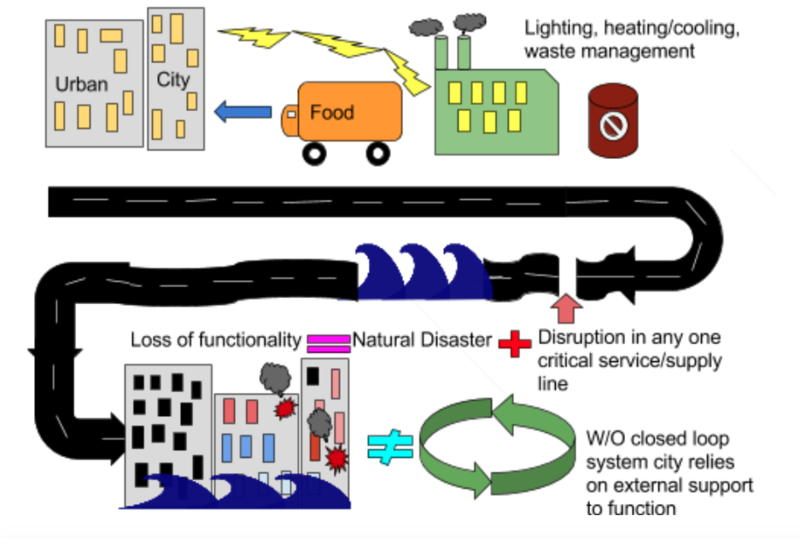 2.Question 2 (In 150 words): What can cities do to lessen the affects of major disasters/changes. Cities can encourage developers to emphasize the services local ecosystems can provide to both the structure and it’s residents. An example could be vegetation on vertical surfaces to provide adequate water absorption, cooling, air filtration, aesthetic and physiological appeal as well. Depending on the topography, the city would best be served to have a biomass plant on high ground as a defense against flooding (if a biomass plant were to get flooded the “mass” could cause outbreaks in the surrounding area due to low hygiene treatment). Encourage local production to meet the cities’ food consumption demand (counties would have to work together to collectively create policies that benefit both) as well as having “farm space” vertically perhaps. Gradually reconfiguring street traffic for pedestrian, bicyclists and motorists use would greatly help in decongesting traffic and maximizing flow. Public parks could be multi storied to take advantage of “air space” over the conventional park on the ground surface. Also include more community-orientated places for leisure. In 150-200 words, explain why you think either we should be ecocentric or anthropocentric? Throughout this course, we have learned may things about how the world works; what hurts and helps the planet in terms of the health and prosperity of the planet and living organisms. In an ecocentric, non-anthropocentric way of thinking, humans are not the most important beings. The world would thrive without human beings. Although we do help many species, I feel as though we are hurting Mother Nature and her natural course. Although I think some species would still be in danger of being extinct / there would still be major natural disasters, It would all be as a consequence of nature and not of human beings. Human-beings cause so much nearly irreversible damage to the earth we are almost forcing ourselves to be anthropocentric by way of necessity. However, we have not found enough ways to sustain our selves in this way. We MUST rely on most of human nature to survive. But our horrible habits of destroying the earth, like mono-cropping, pollution of the oceans and the soil and the air, deforestation, horrible murdering of animals for bulk-meat food by way of huge corporations… and more… is going to make us have to rely on another way of surviving if we keep growing in this way of living. In conclusion, we must be more ecocentric in order for the earth to not be destroyed by human being in the hundreds and thousands of years to come. In 150-250 words, What species would you protect if you think ecocentric is more important? Since, according to most theories, living beings originated from microorganisms, preserving the various organisms that create important, life supporting plants is the most important thing to preserve. There is a “dooms day vault” in Norway, Called the Svalbard Global Seed Vault, where millions of seeds from plants around the world are being stored, just in case anything, like a dooms day, would ever happen on Earth. I think something like this should happen for living organisms somehow too. Obviously, I’m not sure exactly how we could preserve them for ever, maybe by freezing..? But finding the organisms that can eventually produce intelligent life again if anything were to ever happen to us on earth, ie- if karma kicks in and mother nature decides to wipe out all of human kind ( Noah’s Ark style..? haha) we would have a way to regrow again. The United States is home to more than 50 National Parks and hundreds of state parks around the country. They are travelers’ paradise, and they vary in natural features such as the mountains in Wyoming and Colorado, deserts in Utah, and swamp forests in Florida. If you have visited one or more, explain the biodiversity there compared to your hometown/the place you currently live in in 200-250 words. I have been to several national parks but my favorite was the Acadia National Park in Maine. The park is an island off the coast of Maine-making it rich in biodiversity simply for its geographical location. It has its own beaches, shorelines, forests, lakes, mountains and wetlands all within its 74 miles wonderland. Compared to State College, the park definitely outnumber us in types of animals and plants. They have 338 species of just birds, while also home to 37 small mammals, 33 fishes, and also various marine invertebrates and insects. I think it is quite obvious that the reason of higher biodiversity at the park is the relatively lack of human-nature interaction like we experience in State College, particularly in urban development. This allow the nature to continue its course to serve as the natural habitat for the flora and fauna there without unnatural interruption. The park’s location also contributes largely to the cause. With its multiple ecosystem there, many species of animals could inhabit the habitat. The size of these habitats and their separation from other habitats or larger natural habitats limits the types of animals that are found there. Small animals adapted to smaller habitats are therefore more common, unlike the large mammals such as black bears and moose that require large areas and are rarely observed. The balanced ecosystem interaction with human ensures the sustainability of these natural landscapes. 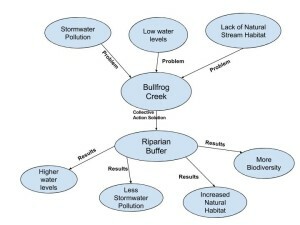 Using a diagram system diagram, show how a biodiversity hazard can occur that can be caused by the HIPPO factors. Elaborate on the diagram in not more than 200 words. 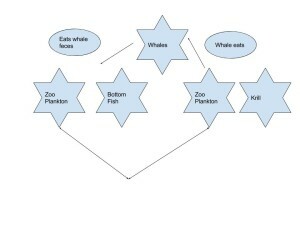 My diagram aims to show how the HIPPO causes act as threats to diversity. I think that human population plays an important role in leading the other 3 causes. The increasing number of human populating our planet requires us to have more shelters. To do this, we need to explore new lands, mostly done by deforesting new areas to make way for property developments. As these areas grow in their functionalities, they grow in size too-and the cycles continues. This will cost large area of habitat loss for many species of animals and plants. To support this growth, we need sufficient food too. So, human over harvest plants and animals to serve our need for nutrients. Another side effect of a growing population is pollution. As more people uses natural resources, more byproducts are produced. Even though technology have advanced, many of these byproducts are not easily biodegradable, thus they leave a bad footprints to the environment. As we look at these factors, take a minute to think; Are we the Invasive Species? Question 1: In 150 – 200 words, describe the biodiversity in your hometown and describe how this attributes to ecosystem services. I come from a small town with many rural surroundings. Being surrounded by many farms and forests, I believe that the biodiversity from my hometown is relatively high. There are a plethora of wild animals that include deer, rabbit, coyote, birds, etc. By having these animals, one of the services of these is a source of food for many of the locals during hunting season. With the predators such as coyotes, it provides population control during the offseason for many prey that would otherwise become overpopulated. In addition to these wild animals provided by the forests, there are plenty of rivers and cricks nearby that provide the same service with the fish. The farms in the area provide many crop and food services to the locals by providing beef, eggs, and vegetables. One farm that is nearby provides the potatoes that are used in Lay’s chips. The trees and other plants that are abundant in my provide cleaner air for the people to breath. These are some of the services that are provided by the large biodiversity in my hometown. Question 2. In 150-250 Words, describe at least two threats to biodiversity in your hometown and how can they be prevented? One of the biggest threats to biodiversity in my hometown would be the agricultural farming that I described in the above paragraph. Although I believe that it could help with diversity with feeding of animals and growing of other vegetables, the habitat loss caused from it can be devastating to the biodiversity in the ecosystem. One way that I believe that this can be stopped from harming the ecosystem is by limiting the number of farms that are being developed in the nearby surroundings. This will prevent the habitat loss to the ecosystem and allow the naturally occurring plants and animals thrive. Another threat in my nearby surroundings is pollution. There are many fracking wells all around western PA that have the potential to pollute the groundwater and thereby, leading to pollution in many regions. This can be extremely harmful to the biodiversity nearby my hometown. There are many ways that this can be stopped. One is to have regulations on the fracking to make sure there are no contaminants leaking into the environment. Another is to have the frac jobs being closely monitored by the EPA to make sure they are meeting standards as well. These are some ways that the threats to diversity in my hometown can be stalled and hopefully stopped one day. In 150 – 200 words explain the most biodiverse place you have been to and why it is so biodiverse. The most biodiverse place that I have ever been to was Puerto Rico. There were so many different species of trees and vegetation growing everywhere. We took a tour through a rainforest there and it was an experience that I will never forget. I think that the reason it was so biodiverse is because of the climate there. We walked up and down big hills to get to a big waterfall. There were areas where it was completely shaded and mainly dry and then there were open spaces where sunlight was able to come through and there were puddles. There were animals that we saw running through the forest, creating a moderate disturbance on the site and creating habitats of their own. There are no people living in the area, meaning that there is no development or compaction of the soils. This keeps the soils fertile and undisturbed and also doesn’t scare away the animals. All of these factors create a very biodiverse area over in Puerto Rico. In another 150 – 200 words explain the least biodiverse place you have been to and why the biodiversity if lacking. The least biodiverse place that I have ever been to is Arizona. While visiting family that lives in Arizona, we did some outdoor activities and it was nothing like the outdoors that most of us are used to. Landscaping was very limited which made it look even worse. I think that the reason for the low amount of biodiversity in this site is mainly because of the climate. It is so hot there that it is almost unenjoyable and I think that the plants and animals feel the same way. The most common type of plant that we saw was the cactus which requires very little water for survival. There is a limited amount of water here which is a serious problem because life of all forms needs water. We went the year after there were a ton of wildfires in this area. The wildfires add more stress onto the landscape and make it even harder to grow more species than it already is with the high temperatures and low amounts of water. Pat 1: Write about a place you have visited with a unique ecosystem, and describe the types and levels of biodiversity that exist there from what you have experienced. What factors contribute to this biodiversity? Was is the same 50 years ago or longer? How have humans impacted the biodiversity in this area? Part 2: What can the government or people in that local area do to increase the level of biodiversity in this region? Who should be responsible for improving the biodiversity in this area? Two summers ago I had the opportunity to visit the Pacific Northwest including Seattle, Vancouver, and the rest of British Columbia. This was one of my favorite vacations I have ever been on, and probably the most beautiful place I have seen. Since most of the area is considered a temperate rainforest, there is a very large amount of biodiversity there. There are many factors that contribute to this. The summers have mild temperatures and pleasant weather, and winters are slightly colder with lots of rainfall. It is very mountainous with a variety of features such as shorelines and sunnier high altitude regions, creating many microclimates. It is also a very old and large area, being directly connected to the rest of North America. This has allowed many types of species from elsewhere in the continent to migrate and thrive in the Pacific Northwest. While this area is relatively natural and untouched by humans compared to most of North America, it still shows scars and issues due to human activity. Being a massive forest, it is very desirable to log throughout the area, especially the valuable redwood trees. Throughout my visit it was incredible to see these massive trees, however very upsetting to see that such a large portion of them are now reduced to stumps. Many species are supported by the existence of these trees and others. The logging in the region has certainly hurt them, although there has not been a significant decline in overall biodiversity so far, outside of the highly populated areas of Vancouver and Seattle. There is still a massive amount of wilderness where many species can thrive. Although there are many things that the local governments and people do to protect the nature in their area, and it has worked well, there are still several things they can do to improve the biodiversity. The most obvious being to solve the amount of logging that occurs. This area is one of the highest producers of lumber in the continent, so it is definitely not easy to reduce the logging when the industry is so large. Because of this, there is little that the people can do. It is mostly up to the government to take more responsibility and stand up to these companies who have lobbied very hard to gain access to these forests and log the amount that they do. Another thing that can definitely be improved is the level of pollution from Seattle, Vancouver, and surrounding populated areas. They are the main sources of pollution in the Pacific Northwest, despite them being quite eco-friendly as far as cities go. The people who live there can certainly still work improve like reducing waste and using more efficient modes of transport. Any improvement in this will help, as the pollution is certainly harming the biodiversity in the surrounding areas. Where I am from in Pottstown, Pa, it is not very biodiverse. At least nothing that is very interesting. My town is fairly simple. It features a mixture of different small ecosystems scattered throughout it. There’s rolling hills that feature some forests and creeks. The forests feature both coniferous and deciduous trees. The creeks and rivers feature frogs, minnows, and trout. Where there are not rolling hills, there are flat areas that are or used to be farmland. Like many other towns in the country, farms are disappearing and are quickly being turned into developed neighborhoods. The weather never gets too extreme, it is pretty balanced actually. The coldest it usually ever gets is 0 degrees Fahrenheit and the hottest will be 100 degrees. More homes are being developed in that area and that really affects the biodiversity and makes everything much less diverse. A lot of times I do like to go into uninhabited parts of woods or creeks and see how much different those areas are because they aren’t seen that much. 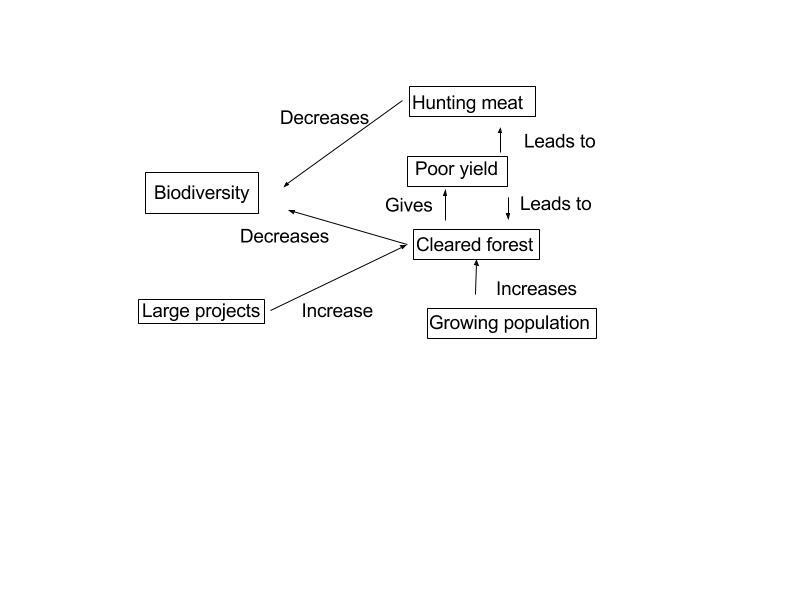 Based on the case study of the Amazon Rainforest, make a diagram showing the changes in biodiversity with arrows. 1. You’re a blacksmith living in a rural region of Alberta, Canada. The economy of your small town has recently gone south after timber prices reached an all time low. Energy companies are inquiring with the town’s government about the possibility of extracting a clean burning, highly flammable metamorphic rock which is found on mountainsides west of town. Allowing mineral extraction would greatly improve the town’s economy while at the same time, around twenty species would be forced to relocate, two of which are unique to your region. Would a better economy be worth endangerment of the species? State your case. In modern society, the battle between preservation and profit is all too common. Prized items like fossil fuels are found by scientists. Large corporations inquire about these resources in hopes of eventual profit. While local economies, many of which are rural and may be struggling, would significantly benefit, habitat loss and possible species extinction may occur. Pollution is also a major threat. In an anthropogenic context, the loss of a few well known species will probably not impact human life. Intrinsically, a living, breathing species now has no population in an area or is gone forever. This argument falls back onto ethics concepts with the bottom line being, species are non-renewable. Once an animal is completely gone, it’s completely gone, at least naturally. Alternative energy is a growing sector and includes many renewable, pollution and habitat loss free ways to make energy. Governments and citizens will continue to fight for extraction rights to increase taxes and power economies. The instrinic value of a species is far greater than any monetary value. Discuss a situation in which biodiversity has taken a backseat to monetary gain. Try to use examples from your town, state or region. In 2011, natural gas fracking began in Pennsylvania. Primarily occurring in Southwestern and Northeastern Pennsylvania, fracking consists of small metal pipes going through the soil and into layers of Marcellus Shale. Pointed horizontally, the pipes emit an undisclosed solution to retrieve natural gas. This is a threat to biodiversity because pollutants often enter groundwater aquifiers. These pollutants may end up anywhere farther down the watershed and be ingested by both animals and humans. Additionally, seismic activity has been linked to fracking in the southern United States. Most notably, a video surfaced a few years ago of a man lighting his tap “water” on fire in Dimock, Pennsylvania. This was likely due to high methane content, a component of the solution energy companies use to extract natural gas. While humans have water quality resources and filters, plants and animals do not. A harsh element like methane could invoke limitless damage on an otherwise healthy ecosystem. New York also has a considerable amount of Marcellus Shale but has not allowed fracking. Why is biodiversity important to achieve? Biodiversity on our planet is incredibly important for a number of reasons. Entire ecosystems rely on individual species to perform their acts in the system. If we start to let biodiversity slip through human action, we could cause a domino effect that wipes out millions of species of animals. If we are to preserve our own existence on this planet, we will need a diverse environment that enables us to utilize the world’s biological resources. Another important idea behind biodiversity is that this planet is the only known in the entire universe that contains human life. Of the vast, vast cosmos, only one blue dot among billions is known to hold the precious life that we take for granted. We should do our best to keep biodiversity alive for the sake of life itself. 2. What role do you see yourself (and mankind) play in biodiversity? I personally believe that we can all collectively make a difference towards furthering biodiversity. We can use political pressure with our combined voice to steer policy towards “green” policies and away from poisonous practices like fossil fuels and over-fishing. Humans have been the catalyst if mass extinctions for too long. We need to take further steps to reduce the impact of the “superpredator” that is the human race. I personally will live my life according to the idea of maintaining a healthy and sustainable relationship with nature, and I hope that my fellow classmates will too. Explain how the increase of human population over the last 200 years have effected biodiversity in the world. The increase in the human population has changed biodiversity in many regions all across the world. As our numbers grow, so does the need for space. This increase in the space that we require to live has caused many forests to be cut down, as well as causing a chain reaction which caused pollution. Deforestation is a big threat to biodiversity. We have caused the extinction of species and we have caused many other organisms and animals to lose their homes. Our “concrete jungles” caused biodiversity to dwindle in many areas, as well as causing many more issues such as pollution. Pollution was caused by our construction of cities. Since we are a very industrialized country, all of the factories, cars, waste, and other factors are causing pollutants to travel both in our air and in the ground. This causes the many organisms to become “poisoned” and that will continue to travel through the food change. Even though human society is great and we are still expanding, we are still the ones that are killing/destroying biodiversity in many areas. Compare your hometown to another location that you have either visited or lived in. Which one was had more biodiversity? Why do you think that? My hometown of Scranton, Pa does not have a lot of biodiversity. Compared to my grandfathers hometown in Taiwan. My grandfather lived in the country side of Taiwan, near Hualien County. It was a small little town but they different animals and plants you could see around it were many. For instance, there would be anything from bugs, to lizards, to wild snakes, as well as some wild animals around the woods. Not only were there a lot of land animals but the town was also close to the sea. I was able to see many different species of fish when ever we went fishing. I think that the reason these two places differ in biodiversity so much is because of the location, as well as civilization growth. Scranton is practically just one big concrete jungle where we don’t see as much greenery as we would in a place like Hualien. Also PA is an enclosed state, so the difference of species of fish here is lacking compared to the sea. List two examples of biodiversity threats in your hometown. Why do you think biodiversity matters? For anthropocentric reasons or ecocentric reasons? My hometown Guangzhou is a populated urban city in China, and like many other urban cities in the world, it has relatively low biodiversity. Two leading threats to the biodiversity in Guangzhou would be pollution and human population. In Guangzhou, you rarely see fishes swimming in the water or birds flying in the sky, and I think it’s due to pollution. The rivers in Guangzhou were polluted and not well-treated until few years back, which was really unsuitable for aquatic life. As the water quality in improving now, it’s still hard to see any aquatic life in the water, but I think we would see some improvements in the near future. Increasing human population is another reason that’s threatening the biodiversity in Guangzhou. Guangzhou is an overpopulated city with a population of 14 million, so people are using up most of the available resources in the city. As a result, there won’t be enough resources like food and space for other species and it’s bad for local biodiversity. Biodiversity is a measure of variation and richness of living organisms at a particular scale, and it is very important for every species on earth. Greater species diversity ensures natural sustainability for all life forms, and we won’t survive without it. For me, I value biodiversity mainly for anthropocentric reasons. Biodiversity can provide us scientific information, recreational benefits, medicine, food, or other materials that can be useful for our life, and we all depend on them. For example, a rich biodiversity not only provide us the food that keep us alive, but also varieties of other food. However, as the society developed, more people start to value biodiversity for its ecocentric reasons. Since we have enough knowledge to make good use of biodiversity, the unused value it provides also matters to us. Just like coral reef system, more people would like to learn about it and maintain it, even though they may not be benefited from it. Explain my knowledge of biodiversity and how that relates to this course. Most of my experience with biodiversity is in the soil. I have taken soils 101 and have learned a large amount about soil microbes and how humans affect soil microbe populations. I find this topic really interesting, so I wanted to write about it. Obviously, using soils for agriculture decreases the microbial population in the soil. There several reasons for this. Elimination of the vast majority of soil niches created by the various plants within the ecosystem happens as soon as the land that will be used for farming is cleared. After this, plowing changes the makeup of the soil, mainly by destroying the soil structure and causing rapid degradation of organic matter in soil (humus), which holds the soil clumps (aggregates) together. Plowing causes the microbial populations to explode for a few days, then have a massive death event as the microbials run out of organic matter to obtain energy from. This results in a soil that has very few niches and a very small population of microbials to fill those niches. Explain ways of preventing biodiversity loss in soil. Easy ways of preventing biodiversity loss in soil that is being used for agriculture are crop rotations, cover crops, no plow or reduced plow methods, intercropping, terrace cropping, and many others. All of these methods increase the niches in the soil, which directly provides the soil with more “room” for microbials to use. Not plowing, intercropping, and terrace cropping can allow smaller grasses and plants that would typically be considered weeds (though they actually don’t negatively impact the production of the farm) to live within the crop, allowing permanent niches that greatly boost the amount of microbials. Cover crops and crop rotations help promote diverse nutrients in the soil, allowing more microbials to be sustained in the soil. How does all of this apply to biodiversity in the world? I think looking at the soil provides a smaller scale model of how the world’s diversity works. Humans building a city is analogous to plowing a field for a monoculture: it is virtually the worst thing we can do for the diversity in the area. Very few niches exist in a large city because (proportionally) very few non-human organisms exist. We can increase the biodiversity of the city by adding small islands of plants, similarly to using intercropping or putting grassy terraces into a farm. Also, by building up instead of out, we can make a city able to sustain more people without taking up as much of the land, also minimizing our impact on diversity. This is similar to increasing global diversity by growing crops more efficiently to eliminate how much land is used to grow crops. Please comment some more ideas about how human activities are analogous to the soil diversity! I could use some help with developing this idea. Explain why biodiversity is important. 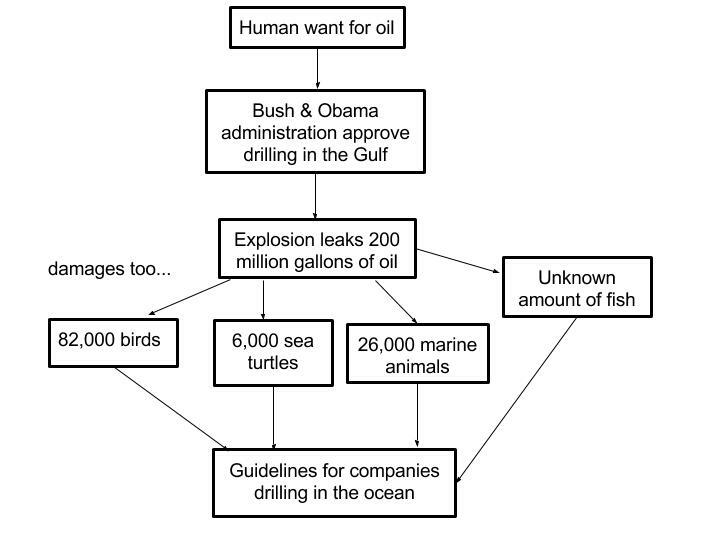 Explain the threats to biodiversity. 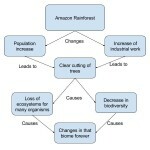 Create a system diagram for the causes of deforestation in the Amazon. Biodiversity means that there are more forms of life we can use. But also, protecting biodiversity is important for ecosystem functioning. An ecosystem with biodiversity is more resilient, so we can take greater advantage of it. If we want to use ecosystems for our benefit, they need to function properly. Ecosystems contain complex relationships between organisms. Losing a species might destroy this order, as illustrated by the example of the honeybees. Humans may decrease biodiversity by destroying habitats, e.g. clearing of rainforest for agriculture. The rainforest soil is typically not fertile and so not conducive to habitation. Another threat to biodiversity is introduction of invasive species. When a new species enters an ecosystem, it might disrupt the prior order. For example, it may introduce unfamiliar diseases that wipe out some species. Another possibility is that the new species may prey on certain species and drive them to extirpation. This is related to overharvesting. 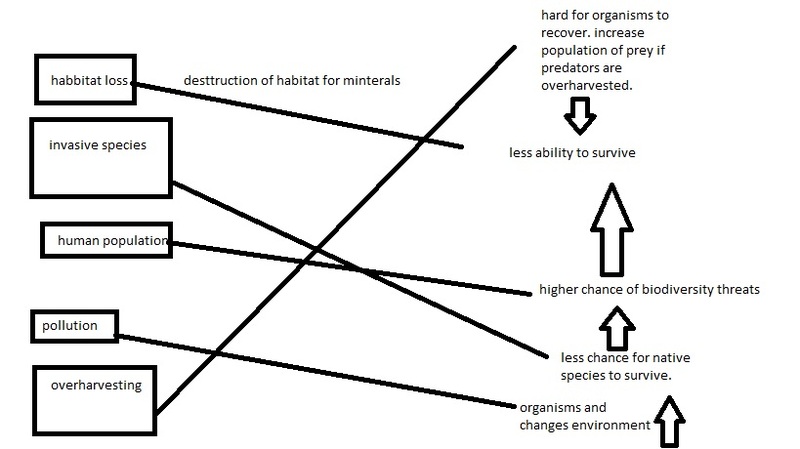 Even if the prey is not extirpated, there may be a permanent decrease in biodiversity by the ecosystem changing to a new stable state. Pollution makes it difficult or impossible for life to flourish. Pollution doesn’t necessarily consist of synthetic chemicals such a plastics; it can also be naturally occurring chemicals present in too high concentrations. Even chemicals released into the environment at initially low concentrations can end up in high concentrations in some organisms via bioaccumulation. Finally, a growing human population can threaten biodiversity by e.g. habitat loss or pollution. Explain the diagram above in 250-300 words on how it links to the article and explain the core ideas in relation to what is drawn. 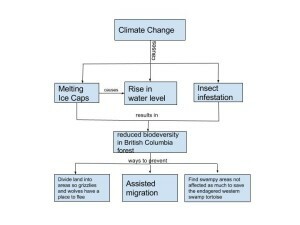 The diagram above shows ways to prevent the reduced biodiversity of species living in the British Columbia habitat. The article includes discussions from various scientists with suggestions on how to protect the wildlife in the area. 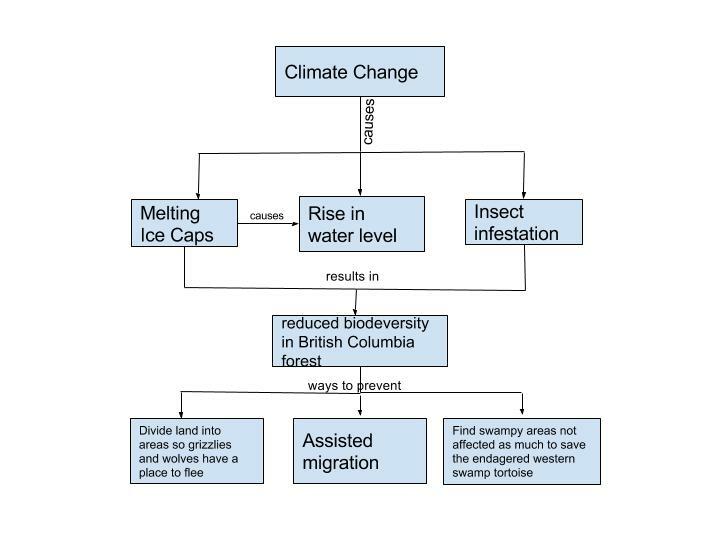 The basic concept behind the diagram states that due to climate change wildlife is being heavily impacted and causing different species to be endangered. Melting ice caps causing an increase in water levels means there will be less area for animals like grizzlies and wolves therefore a method to protect them was suggested by a scientist. The method involves dividing the land into 90 square meters and analyzing each area in terms of how it will be affected by the climate change, in doing so they will be able to identify what areas of land will be suitable and safe for the wolves and grizzlies to flee to and survive, this way they will be able to protect the species for a certain period of time. 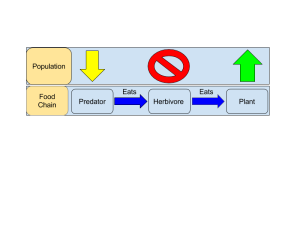 Another prevention method listed in the article and in my diagram involves migrating the animals in the habitat by us, as they would not be able to do so due to cities built around them. This however is an extremely difficult task and in my opinion should not even be considered as it will be very difficult to move them and it may come to a situation where decisions are being made on which particular species are to be saved, which in my opinion is not a decision that lies in our hands. Lastly, moving them to other swampy areas that suit their survival methods, which to me is a good way to go about it as only one species is being moved, can save the endangered species of the western swamp tortoise. Since Dubai is a desert and there aren’t many animals there, except for camels most importantly reduced biodiversity isn’t that big of an issue. However Dubai does have a turtle rehabilitation center where injured turtles are taken and taken care of until completely recovered. Once, recovered they are sent away back into the wild where the habitat is suitable for them. Apart from this camels have the tendency to graze the land, therefore endangering certain plant species. However in areas where camels do not exist vegetation regeneration has been considerable and therefore protected by the government. 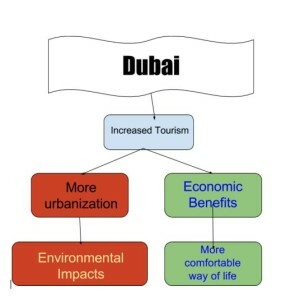 The biodiversity in Dubai is considerably different to that of the British Columbia habitat as there aren’t that many species in the area, however the species that do exist are well taken care of as the area is a lot smaller in comparison to that of the forest in B.C., and also a lot less in number compared to that in the forest making it easier to control the animal species in Dubai. 1. explore your hometown and find any threats to biodiversity. 3. Give examples of how the HIPPO is all interconnected. Biodiversity is an important detail for much of the world. In my hometown of Greencastle, I have thought of things that damage the biodiversity of our area using the HIPPO acronym. In my area I can see how human pollution can hurt the biodiversity in my hometown. There are several farms in my area that may pollute the water. I live near a creek that has had a lot of manure seemed to be run off in it. I feel as though this hurts the creek when it comes to the cleanliness of it. This may increase the amount of bacteria which may hurt the environment in the creek. Also, there is an invasive species of plant that happens in nearby streams. The plant has become so invasive it spreads downstream using the stream to disperse its seeds. This may stop growth of others plants as well as perhaps muddy up the streams as well. It is important to keep in mind the several different factors that may affect our biodiversity so we can live in a more sustainable environment. Biodiversity is an extremely important topic when talking about sustainability. It is important to realize that all the organisms relate a lot. If in any way one species is affected, it affects the whole biome in turn. As we learned in the module, when bacteria get polluted, it may not affect whales. 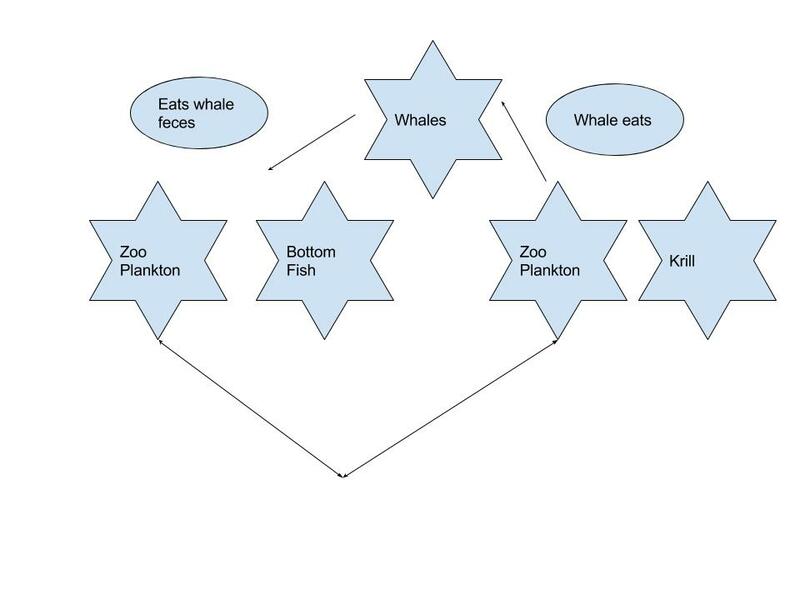 However, if the whale it’s the fish that eat the plankton on bacteria they will in turn be damaged. Invasive species also hurt all the species because they do not have any natural predators and they eat the same foods as other animals that cannot predate the invasive species. As we can see, with every threat to biodiversity it is true that it does not only affect one species but truly does affect the whole environment. Talk about the biodiversity of your home town or where you currently live. Include examples of plants, animals, and other inhabitants and how they contribute to the ecosystem. Should be a paragraph from 150 to 200 words at least. In a second paragraph 150 to 200 words, explain some human impacts that are destroying biodiversity. Explain how it effects your hometown and how it effects the whole world. 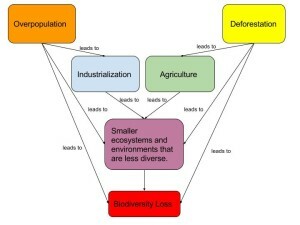 Create a system diagram of biodiversity and include the human impacts, and other environmental impacts that effect it. I currently live in Boalsburg, Pennsylvania. Pennsylvania is home to over 25,000 species of known organisms (I Conserve Pa 2012). There are 800 of these species that are rare or considered endangered which means there is a chance of extinction. I do not believe there is a particularly important species of plant, animal, or organism in Pennsylvania that would be more important than others. But I do believe that every species plays a significant rule in the ecosystems around them. Pennsylvania has a good amount of towns and cities but it also has its fair share of rural land as well. A perfect example of biodiversity loss is in the colony collapse disorder of honey bees. This is a huge impact on Pennsylvania’s biodiversity because honey bees help pollinate most of our crops for food. It is important that we keep our biodiversity very diverse because this can make our ecosystems more resilient and less susceptible to threats. The mountain lion is another animal that people do not know if they are extinct to the northeastern region yet. You may know it better as the “Nittany Lion.” The conclusion is that biodiversity is very important in sustaining our ecosystems that we live in, so it is up to us to protect biodiversity and strive for healthier sustainable environments. There are many factors that lead to biodiversity loss, but the biggest threat is human impact. Some examples of human impacts would be over harvesting (including hunting, fishing, gathering, etc. ), agriculture, over population, pollution, buildings/ industrial factories, etc. I would say the biggest biodiversity losses in Pennsylvania would be from over population, and deforestation for agriculture. Pennsylvania has been using deforestation for a while to produce lumber. Now the forests are cut down for agriculture to grow more crops, because an increase in population means and increase in food. Over population for biodiversity is not just effecting Pennsylvania, but the entire world. Pennsylvania has its fair share of state forests and parks but we need to make sure we are conserving and monitoring our biodiversity in other regions as well. We all need to cut down on population growth and cutting down our forests and focus on alternative and healthier ways to create food and wood to conserve our biodiversity. Our species of animals, vast valleys, and extravagant landscapes of Pennsylvania make it very beautiful place but to conserve this beauty and biodiversity the people are going to have to make changes to everyday life. Biodiversity is how the ecosystems and environments work together as one, so it is important that we keep all living things in a healthy state. 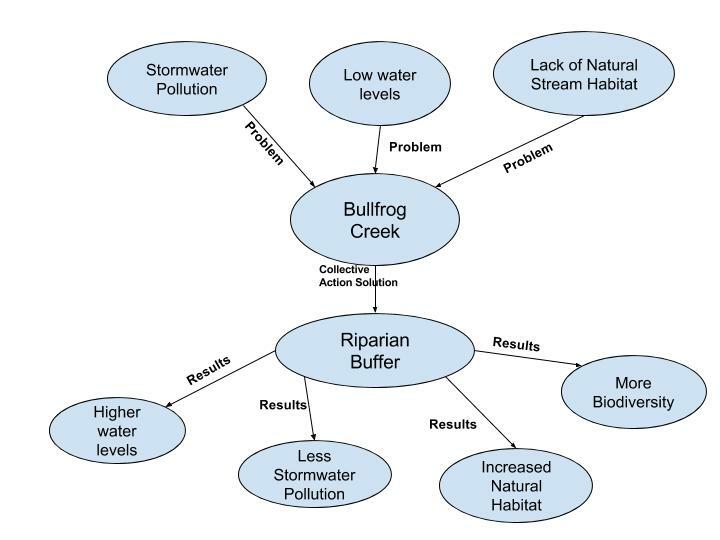 Create a system diagram describing a local issue covering sustainability or conservation in your area. Describe how the issue is being approached in the area and the affect of action or inaction with regards to the the issue. This is once again addressing the drought that has taken hold of California. While there are actions that are accounting for the loss of water from the reservoirs and the lack and of rain. 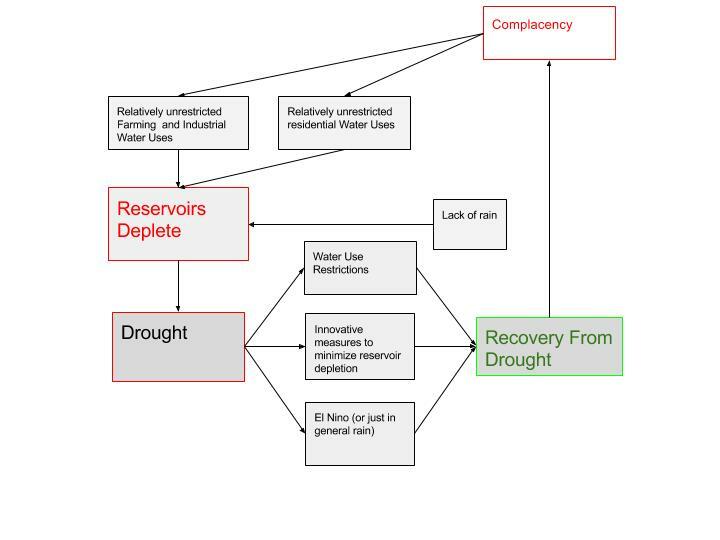 California’s reservoirs almost function cyclically and the cycle is based around El Nino. The reservoirs, the farms, and local water sources all work with the existing interconnected water sources, melting snow cap, and El Nino mostly to replenish their supply. An increasingly hot couple of non El Nino years coupled with increased farming and increased population have lead to the current drought situation in California which has created a dynamic that requires governance to preserve the water sources in California. There were restrictions that were placed on water usage for watering yard plants and were placed on the use of water with regards to washing your vehicles, and recommendations for general water use reduction in the household. Those restrictions are a look at the micro, whereas there was innovation that was required when looking at the macro, looking at the larger water reservoirs and possible ways to prevent the loss of water. One such innovation was the use of millions of black polyethylene balls in major reservoirs to prevent the evaporation of such water sources, the balls were also used as a preventative measure for preventing the production of bromide by chemical reactions activated by sunlight between bromine that occurs naturally in the water sources and chlorine which was used to disinfect drinking water. “Called shade balls, 80 million of the hollow black orbs are needed to cover the reservoirs in Los Angeles to stop sunlight from triggering a potentially dangerous chemical reaction between bromite, which occurs naturally in groundwater, and the chlorine used to disinfect drinking water.”(Plastic News, 2014). These innovative new practices and restrictions coupled with the most recent El Nino have shown that net positive changes can be made. Net positive changes are good, even though after the most recent rainy season we are still a great distance away from recovery from the drought a more pessimistic view can look at the cycle and see the repetition. The approach to the water crisis has been reactionary, the consensus from everyone I have met has been a tiredness from governance and contrary to a sustainable approach to the idea. While innovation like the black polyethylene balls with be permanent changes, governance and water use restrictions will not be, once the state is clear of the drought the restrictions will be lifted and relatively unrestricted water use will be restored. What needs to happen is massive education on conservation and sustainability, or complacency will take hold and there will be a return to the situation that got the state to the situation that it is in. The water sources have shown a significant amount of resilience with regards to the the drought and the significantly warmer and dry periods between El Nino’s and the dwindling snow caps. What needs to happen for proper sustainability is the maintaining of the water use policies by the government to assist in sustainable water use as a permanent policy not as a reactionary policy. For my biodiversity hotspot I chose the Horn of Africa. The Horn of Africa hotspot is located in the north- eastern part of Africa, covering the Rift Valley. Originally the hotspot was 1,659,363 km2 big, but today it is only 82,968 km2 big. Unfortunately, only 5% of the original habit remains today. There are two main threats causing this hotspot in Africa to deteriorate at such a quick rate. The first issue pertains to the H in H.I.P.P.O, which is habitat loss. The people of that area have been harvesting charcoal without government control causing detrimental effects to the hotspot. The second threat deals with the O in the acronym, which is overharvesting. There has been an increasing amount of hunting in the past years which puts many species at potential of extinction. Species such as the beira, dibatag and Speke’s gazelle, who are only found in this area, are facing the biggest threat. Being one of the most degraded hotspots in the world, the Horn of Africa is facing the potential of being completely wiped out. In 150- 200 words describe whether or not you value biodiversity and why. Are your views anthropocentric or ecocentric? Why? Do you think future generations will have the same levels of biodiversity? I think that biodiversity is very important to our everyday way of life. Without biodiversity we would not be able to have some of the life saving medicines that we have today. We also would not have luxuries such as beautiful landscapes and large varieties of species. Though my views of biodiversity may seem anthropocentric, they are in fact ecocentric. While I do value the potential uses we can receive from protecting all these endemic species, it is not my immediate reaction. In simple terms, I receive fulfillment is simple knowing that species are alive, undisturbed and overall healthy. Allowing my future generations to enjoy the diversity just as I have is important to me. Unfortunately, at the current rate of destruction of biodiversity there will be almost nothing for future generations. As I mentioned in my earlier question, a single hotspot is only 5% of its original size. At this rate we risk losing a huge portion of the world’s biodiversity. 1.In 250 words or less, decribe issues related to biodversity in your hometown. I am from the suburbs of Pittsburgh, Pennsylvania. There are many issues in my town that affect biodiversity. Pittsburgh is a city that is growing fast in population. The increased population puts strain on much of the wildlife in the area. More housing complexing are bing built which is contributing to habitat loss for many creatures. The increased population also increases the amount of pollution created. Another issue related to biodiversity that affects my hometown is the large population of fishers and hunters. This leads to overharvesting of fish and disrupts the population of deer in the area. In 250 words or less describe ways in which you can help preserve biodiversity. Humans have very large impact on biodiversity. There are many things I could do in my everyday life to help preserve biodiversity. When gardening I could limit the use of pesticides and be careful of what types of fertilizers. This would prevent help to prevent habitat loss for many animals and other living creatures. I could also eat more organic food. This would decrease the amount of fertilizers farmers are using. I could also buy sustainably harvested seafood. This would help prevent overharvesting. Recycling and using more products made from sustainable materials would help decrease pollution.It would also be helpful by limiting the amount of energy i am using by taking shorter showers and only using lights when necessary. 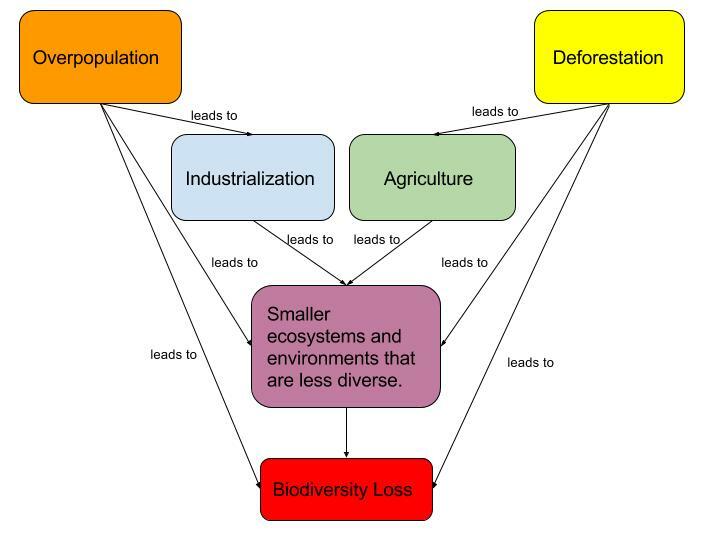 The learning activity I decided to give myself was to create a system diagram of something that lead to a loss of biodiversity. Also within my learning activity I had to talk about my diagram. Finally, the last part of my learning activity was to relate biodiversity to something I’ve experienced in my life. For the first part of my learning activity I drew a system diagram about how the expansion of china has led to the loss of pandas. 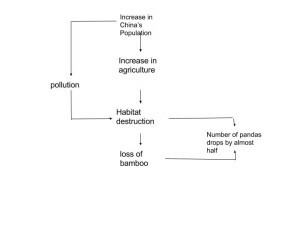 Obviously, the over population in China has effected much more than just the pandas, but for my diagram I focused mainly on pandas. Pandas populations have dramatically decreased due to China’s farming practices and overgrowth. As we learned in this module biodiversity is threatened by growing human populations and consumption levels, making this a perfect example. The diagram is simple, but shows how the loss continues. As China grows they require more land. This in turn requires them to use more forests, taking the pandas habitats. Also, they’re cutting down the food supply causing it hard for pandas to survive. This has to do with acronym H.I.P.P.O. 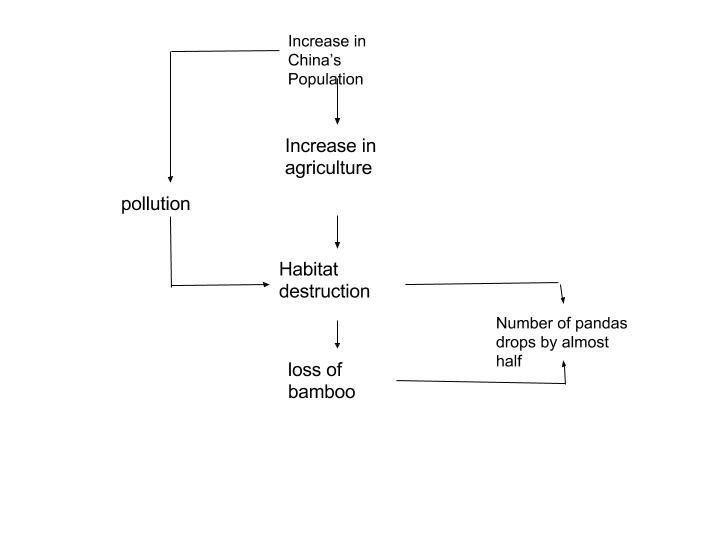 In this case habitat loss, and human population is what is affecting the pandas. In module 10 we learned that this is normally due to agriculture activities, like the ones in China. We also learned that the impacts of biodiversity fall largely on population size. This also depends on the types and amounts of resources they’re using (I=PAT). However, the overall population in China is what’s causing the species loss. A personal experience that I’ve had with biodiversity loss was when I was interning at a state park. We had a problem with invasive species which eventually lead to a decrease in some species because they didn’t have any food. The invasive species of honey suckle took over an entire field. To get rid of it we physically had to cut it down. As we learned in this module, new species in an area competes with the other species for food. In this case the honeysuckle was winning, killing everything else. The honeysuckle didn’t just affect other plants, but also the animals. Birds were feeding on berry bushes growing in that field which were killed by the honey suckle. After the honey suckle took over we saw less birds in the area. Part 1. Draw a systems diagram representing the state at which biodiversity is changing today. Be sure to include detailed information about the reduction/conservation of biodiversity and how these factors effect it. The diagram should have at least six system components and the arrows should point in a logical direction and be explained. Part 2. In a paragraph of 250-350 words, explain the ideas behind your diagram and connect these ideas with concepts you learned from other modules. Part 3. In another paragraph of 250-350 words, present an example of a threat that effects biodiversity in your hometown and what steps could be taken to reduce this threat. 2. Biodiversity plays a crucial role in the future of sustainability, this is why we must continue our efforts to conserve the environment in order for biodiversity to thrive around the world. 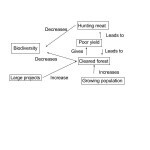 In my diagram above I have shown some of the problems concerning the reduction of biodiversity and the steps that have been taken in order to reverse these effects. The diagram uses contrasting red and blue text blocks to depict the problems (red) and solutions (blue). The first red block closest to the top gives a general overview of the main issues negatively effecting biodiversity. I then broke the main block down into two categories, human and non-human factors. Each of these categories contain specific examples of human and non-human factors and how exactly they are impacting biodiversity. On the other side of the diagram I have the blue blocks containing information on the conservation efforts to help grow biodiversity. Some of these efforts include a stronger push for conservation through which people use the idea a collective action to help raise awareness of reduced biodiversity around the world. Another catalyst in this conservative movement is the work The International Union for the Conservation of Nature has been doing. They’ve created a systematic scheme of the different levels of protected areas and what each of those areas means in terms of what they do for conservation. However, in order for these conservative efforts to have a greater effect, more of us need to acquire an ecocentric mindset. We can continue to develop as a species but we need to learn how to do it in such a way that protects habitats and other ecosystems while trying to gather the resources we need in order to thrive. 3. Anyone who has lived in or visited Pennsylvania, especially during the summertime, will probable be familiar with some of the many bugs that call this state home. Most bugs play an important role in the food chain and even agriculture but there is one species in particular that seems to be doing more harm then good. The Brown Marmorated Stink Bug or stink bug for short is an example of an invasive species that has been impacting biodiversity in Pennsylvania. Originally found throughout East Asia, it is speculated that the stink bug was brought over to the U.S through shipping materials and was first discovered in the late 1990s in Allentown Pa. In module 10 we learned about some of the dangers invasive species can pose to biodiversity and what it could mean if that problem isn’t dealt with. Stink bugs have been known to feed on a variety of plants, including fruit trees, ornamentals, and various other crops. Since the stink bug has no natural predators here in the U.S, they can continually cause damage to locally grown produce. So the question remains, what can we do about these pesky insects. Insecticides are one option but why spread more chemicals into the environment when there are other ways to deal with them. I have known farmers who have used mineral clay as a means of preventing stink bugs from both laying eggs and feeding on crops. Another effective way to get rid of stink bugs are to buy stink bug traps. We have used some of these traps around my home and I was amazed at how many these things could hold, there must have been hundreds of stink bugs in each one. The nice part about stink bug traps is that they aren’t polluting the environment with toxic chemicals and they are made to only attract stink bugs. The Amazon is a perfect example of a biologically diverse ecosystem. One way that the Amazon is biologically diverse is its latitude. Because the Amazon is closer to the equator and so for a number of reasons means the Amazon is very diverse. The Amazon is a great example of biodiversity but, it does have it’s flaws. One way that the Amazon is not that biologically diverse is it’s smaller area. Another factor that makes the Amazon biologically diverse is its physically diverse habitats. Just within jungles there is high diversity even in a single tree. ecosystem’s vary from the top of a tree to its base. Each layer of the rainforest receiving different amounts of light, and rain, while other organisms learn to survive without sun and rain. One factor of biodiversity is having a larger area. Because the Amazon is not all that big altogether accounting for only 6% of the Earth’s land surface but making up over 50% of the Earth’s biodiversity. The Amazon case study starts off by explaining how my home state of Pennsylvania may only have 30-40 species of trees when describing our lack of biodiversity. So obviously Pennsylvania is not the most biodiverse ecosystem. One way my hometown of Lansdale, Pennsylvania is not biodiverse is a lack of a physically diverse habitat. My hometown is very much either residential or farm land. We have a very flat terrain and our weather is pretty uniform. Another way my hometown is not biologically diverse is a lack of longevity in the ecosystem. Solely because of human development, the ecosystem in Lansdale has not experienced a time of peace without human disturbance for as long as I have lived in Lansdale. There is always construction going on with new development’s being built in areas that used to be fields. The constant development of my area could be considered moderate development that really prevents the ecosystem from every building up its diversity. Relate biodiversity with two concepts from other module from this course in 100-150 words. Biodiversity relates to the module 9 topic of climate change. Climate change directly affects biodiversity. Because climate change affects ecosystems due to temperature rising, species living within specific ecosystems cannot adapt to these changes and become extinct – thus reducing the biodiversity of that ecosystem. Biodiversity also relates to the topic of sustainability. Biodiversity is a building block of sustainability. The variety of life on Earth is what contributes to the definition of what sustainability is defined as in previous modules: “utilizing species and ecosystems at levels in ways that allow them to go on renewing themselves for all practical purposes indefinitely.” Without biodiversity, ecosystems cease to exist since biodiversity is what allows an ecosystem and species within it to thrive. If ecosystems become endangered or extinct, we cannot utilize them or have a functioning environment for sustainability. 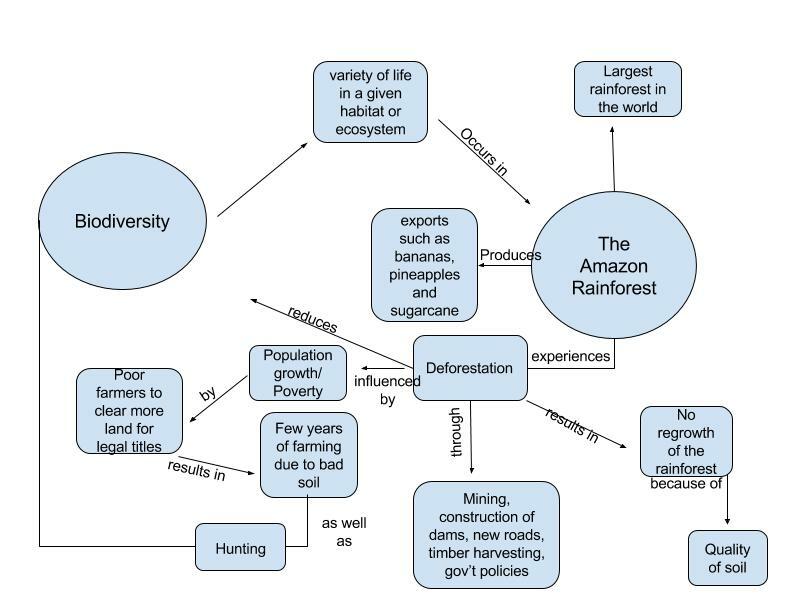 Create a systems diagram for the Amazon Rainforest and briefly explain it. 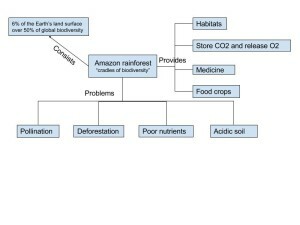 This is a systems diagram on the decrease of biodiversity in the Amazon Rainforest. I chose to focus on the factors that decrease biodiversity in the Amazon Rainforest: deforestation, clear cutting, and poor nutrients within the soil. Together, these three factors decrease biodiversity within the Amazon Rainforest since it takes away the home for animals who live in the trees and creates an unsustainable living environment for the fauna present in the Amazon Rainforest. Unfortunately, this is something human activity drives and there should be steps taken to preserve the Rainforest, one of the best biodiversity areas in the world. Part 3: Comment on two other students post comparing and contrasting your post to theirs. Giving valuable feedback to the students post and also leaving a link to your post. Part 1: For my endangered species I chose the Canadian Lynx. I chose this mammal because I have very little knowledge of the lynx and wanted to gain a further understanding of why they have now become endangered. The Canadian Lynx is likely to be found in the far northern parts of the United States and much of Canada. It is unlikely to be found in areas lower due to its long legs and large feet it is built for hunting and deep snow and also its coat is built to withstand the harsh winters in the northern part of the North American continent. The Lynx has been placed on the endangered species list due to the lack of its natural habitat. The forrest and wooded areas in which the lynx is most likely to be found is greatly decreasing in quantity. Due to timber harvesting and recreational locations being built the lynx are being pushed out of there natural habitats. To fix this issue, I would implement strict deforestation laws that would prevent the harvesting of timber in certain locations that have been designated for the lynx to be able to live comfortably. It is not right that their home is being taken from them, we as humans can not just take the land that is not ours and has been these animals homes for centuries. That is why I believe strict laws preventing the harvesting of timber in certain areas would help to prevent the endangerment of the Canadian Lynx. My hometown is Perkasie, Pa which is located about an hour north of Philadelphia and 30 mins from the New Jersey boarder. Perkasie has a mixture of small towns and cities to some rural areas. I consider my hometown to be fairly diverse biologically but can sometimes be threatened. We have a large amount of varying plants, and animals as we are located in a farming community but the development of farm land is a growing issue. As the deforestation increases in our surrounding areas we notice the lessening of natural animal in our lands. Luckily in Bucks County we have a preservation society in place that helps to protect farming lands from being purchased from developers to put up more homes in the area. Although this cannot necessarily prevent the development of all of the lands in my area it can at least ensure that my hometown will not be crowded in by new homes and business buildings but will remain at least partially a farming community. I have grown up in a farming community and would not change it for the world, and will do my best to help preserve this level of biodiversity as best I can in years to come. Assignment: Read the information about Costa Rica’s conservation efforts in Module 10. In one paragraph, discuss what anthropocentric and ecocentric benefitis this could have. In a second paragraph, talk about how actions like this could be taken to conserve biodiversity in your area or region. Costa Rica has made a serious investment into their biodiversity by committing to be proactive in their conservation. 25% of its land has been set aside in national park in order to keep at least 80% of its remaining species intact. Also, Costa Rica ended subsidies that encouraged deforestation. Anthropocentric benefits include a blossoming tourism industry that has bolstered the economy. Also, the diversity should keep the region more stable for agriculture. Ecocentric benefits include the protection of more species, cleaner rivers, less soil erosion, and fewer greenhouse gas emissions. In the northwest region of PA, there is not much land set aside for natural habitat. One example of an existing park would be Presque Isle on Lake Erie, which draws in thousands of tourists every year and generates a lot of business for the local economy. It also protects many native species of plants and animals and preserves a natural piece of the Great Lakes’ shore. Rampant destruction of natural habitat is not a common occurrence in the area, but there would still be recreational and ecological benefits to more land set aside for natural habitat. There is an extensive amount of state game lands in the area that do provide some of this, but they are not very accessible even if they are open to the public. I think it would be beneficial to create more state parks with facilities to make it more attractive for people to visit and enjoy PA wilderness. 1.Since human activities can either enhance or disturb biodiversity that means that biodiversity ties into human-environment coupled systems. Is your hometown currently trying to protect its biodiversity or threaten it? Explain why or why not. The H.I.P.P.O. Model can help guide this question. (200-300 words). In my hometown of Harleysville, PA we have actually taken steps to help prevent water pollution and erosion from harming the creek’s ecosystem located in my backyard. This project developed was a called a Riparian Buffer Project in Lower Salford Township. This project was started out of concern for the lack of management of storm water runoff, which was causing water pollution and there was a lack of natural habits and water in the creek. The goal my community and the local water shed had for this riparian buffer was to decrease water pollution, increase the water flow, and create a more natural habit for the biodiversity living in the creek’s ecosystem. The project has been a long-term collect action problem in my community that began in the summer of 1999. It began by the township implementing grass-cutting laws in my neighborhood’s backyards, located along the creek. The next 10 summers after that people from my neighborhood and other members of the community would volunteer to plant trees, shrubs, and other native plants into the buffer zones. Since 1999, there has been less work to do every summer and now the buffer is really beginning to thrive with wildlife, plants, and the water flow has immensely increased. The project was so successful that my township began working on other parts of the creek a few years ago. Because of the success of this project, I can say that my local community has taken collective action to help better the human-environmental interaction in my hometown. In my opinion, this would be an IUCN Protected Area Category 6, Managed Resource Protected Area because it was created for the long-term sustainable use of the humans in my community. 2. Create a system diagram representing how your community is either taking steps to protect or threaten biodiversity. In my hometown I think that members of my community can continue to use collective action in order to help create more biodiversity in my hometown by helping to pass and create more and new laws that help to create more biodiversity, such as riparian buffers, in my township. For example, my community has only create a riparian buffer and there a many more streams, creeks, and bodies of water in my local area that would greatly benefit from a riparian buffer. Since 1993, there has been a 23% increase of residential land use according to the township. Residential land development makes up about 43.8% of my community compared to the 15.2% of parks/recreation and the 29.7% that is agriculture/underdeveloped. By using collective action to pass laws that require more natural habitats around these developed areas, such as the laws in effect in my residential neighborhood, it would help to balance out the biodiversity in my local community. By creating natural habitats surrounding neighborhoods, not only would it increase the property value of residential homes, but it also will help to help to provide a better human-environmental coupled system in my area. My community can use collective action by writing letters to members in office, running for government positions, and signing petitions to help to gain support for more balance in the environment. In 200-250 words, choose a specific hotspot around the world and describe the biodiversity in the area. Then outline dangers humans have imposed on this hotspot. The hotspot I have chosen to focus on is the Great Barrier Reef. The Great Barrier Reef is the world’s largest coral reef system, comprised of over 400 different types of coral, 1,500 species of fish, and over 4,000 species of mollusk. The Great Barrier Reef spans over 1,400 miles along the cost of Queensland, Australia; it is a structure so large, it can be viewed from outer space. The reef contains extremely unique biodiversity, where completely different ecosystems exist along the depth of the reef, laterally out into the ocean, and along the length of the coastline. Similarly, to a tree in the Amazon, a single coral reef system may house hundreds of different animal species. The biodiversity is in great danger, due to many different human influences. Climate change is the GBR’s greatest threat, where sea temperature rise causes coral reef bleaching. This phenomenon occurs when temperature limits are exceeded, and corals expel the algae that live inside them. The symbiotic relationship between algae is destroyed when bleaching occurs, and the plants and animals that rely on the algae for nutrition do not survive. 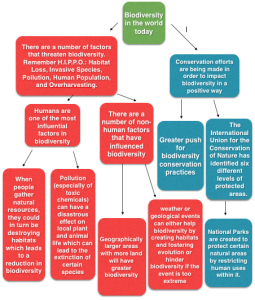 Create a systems diagram relating the general impacts humans have on biodiversity around the world. 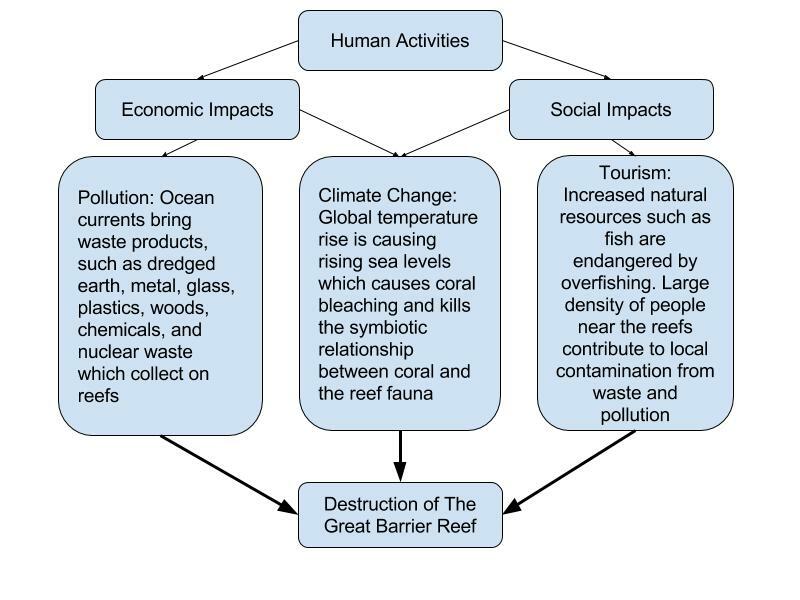 The systems diagram outlines the impacts that human beings have on the destruction of the Great Barrier Reef. Economic activities such as fishing, infrastructure development, technological development and production all produce different types of wastes and pollutants. Humans may bury these wastes in the ground, keep them in landfills, or may directly dump them in the ocean. These wastes inevitably make it into our waters, where currents transport them all over the planet. Subsequently, wastes are deposited on the Great Barrier Reef which directly damages both flora and fauna occupying the reef. Social activities such as tourism bring significant attraction to places like the GBR. Although tourism might spread awareness about the damages being done to the GBR, it is also directly damaging the reef itself. 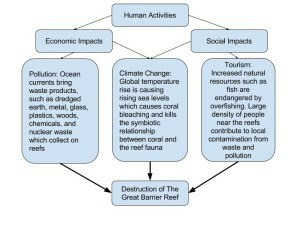 Large numbers of people visiting the reefs may disrupt local ecosystems, and trash produced by the tourism ends up collecting in the reef, and destroys it. Lastly, climate change is a result of both social and economic activities, where human activities all over the world is causing temperature rises, which in turn, causes sea temperatures to rise. This disrupts the coral reef systems, for example coral bleaching, which directly damages the reefs. Include something from current events, or your own life, or something else that deeply matters to you. I absolutely love to travel. If it were possible, I would definitely be traveling for the rest of my life. I love visiting new places, completely different from New York where I am from, and experiencing all of the different aspects of the environments that I am in. I absolutely love hiking, and exploring, and seeing all the different animals that inhabit these different areas. The world has absolutely amazing biodiversity, most of which many people are not able to experience at all throughout their lives. For me personally, I would love to be able to travel and experience as much of the biodiversity in these different areas as I possibly can. For all we know, Earth may contain all of the biodiversity in the entire universe, and most people stay in one place and do not even attempt to experience it, and unfortunately, actively destroy it. That being said, I believe preserving our biome, the Earth, is one of the most important things humanity can achieve. Like I said, the Earth may be one of a kind in the entire universe, and we need to preserve it so we can enjoy it hopefully forever. At least in our own anthropocentric ideology, without the Earth and the conscience beings inhabiting it, the Earth and the universe would be utterly pointless. Pick a Biodiversity Hotspot and talk about a protected area located in that region. What level is it classified under? What species is it protecting? What policies are they enforcing? Describe how one of the species being protected is important to the ecosystem. Why are we protecting this specie? Is it for anthropocentric or ecocentric reasons? Create a system diagram that illustrates the interactions between the specie the environment and humans. I picked the California Floristic Province Biodiversity Hotspot because I am from California. One protected area is the California Desert Conservation Area. It is home to the threatened desert tortoise, the endangered Peninsular bighorn sheep, the cushenberry buckwheat, and many other species that have adapted to live in harsh desert environments. Unfortunately, this conservation area consists of a few national parks which is considered a category 2 protected area, and since people are allowed to participate in many different activities it causing these species to suffer. There were settlement agreements in 2000 and 2001 that prohibited mining of 3.4 million acres, reduced or prohibited livestock grazing on 2 million acres, prohibited off-road vehicles on more than 550,000 acres, and closed more than 4,500 miles of roads. There have been many lawsuits against the Bureau of Land Management for allowing human activities in wildlife habitats and for delaying policy implementations. The Peninsular Bighorn Sheep need high visibility to escape from predators. They are herbivores and eat desert plants like cacti. They also get their water sources from plants like cacti. This specie does not necessarily have a huge impact on human life so I believe that the protection of them is clearly ecocentric. However, in the past, humans most likely used their horns for tools and weapons, but we do not have that necessity anymore. There is also a theory that the Peninsular bighorn sheep is endangered due to climate change and the severe droughts that California has been facing. 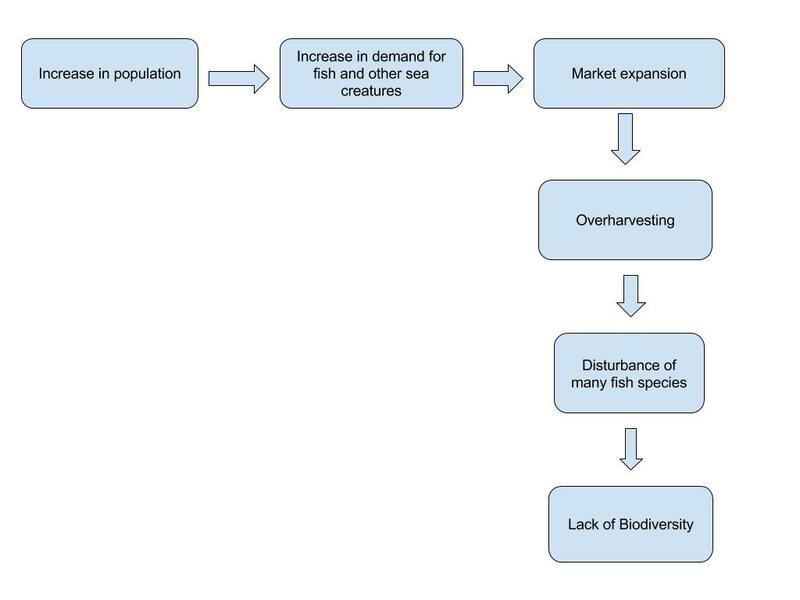 Make a system diagram that explains what happens when a species goes extinct in an ecosystem, and talk about the importance of biodiversity in relation to this in 150-250 words. Biodiversity is part of what helps an ecosystem thrive. Each organism feeds off of another organism in the system and maintains a balance. Everything within the ecosystem is limited by everything else. Animal populations can only grow so large until they exceed the carrying capacity of that ecosystem. If the system is diverse, an animal may have multiple food choices. The more diverse the system is the more stable the populations would be. It is also very precarious in the sense that if one population declines, and a group is dependent on that population for food, it make that population decline. The system diagram shows this relationship, and then shows the effect on the plant life that the extinct population would feed on. By having a large biodiversity in an area it can help stabilize these populations. In 150-200 words describe a threat to biodiversity in your hometown and how you can help prevent this threat. The acronym H.I.P.P.O represents a way to remember the different kinds of threats to biodiversity. The “I” in this acronym stands for invasive species. In my area there are many invasive species problems. One of the greatest and fastest growing invasive species problem is the snakehead. The snakehead is native to China, Russia, North Korea, and South Korea and ever since they have been introduced to the water ways near my hometown of Waynesboro, PA, the native populations of fish have been effected. The snakehead is a top predator that is eating native species and causing great decreases in the native species populations. Snakeheads reproduce very quickly and this is creating many problems. DNR is working to solve the problem by advising to kill snakeheads immediately when they are removed from the water. As an avid angler, to help protect the native populations of fish I will help prevent the snakeheads threat to biodiversity by complying with the DNR’s request to remove the snakeheads from the water if I catch them. 2. In 150-200 words explain discuss human extinction hazards and how to prevent these hazards. There are many hazards to the human population some that we can help and others that we can’t do anything about. One of these hazards that we can prevent is extinction by climate change. We could have great problems adapting to the climate change and go extinct from being too hot. Climate change is also effecting sea levels which could rise to such a point that humans could be wiped out of certain areas. Climate change is a slow process that could take decades or centuries to effect us but we should prepare and try to prevent this from happening by lessening the input of greenhouse gases into the atmosphere as we have discussed in previous modules. One hazard that could cause human extinction that we can’t really prevent is the impact of an asteroid or comet hitting the earth. This scenario is very unlikely but there isn’t much we can do to prevent it. Our extinction from an asteroid impact would be caused by dust and tsunamis, not the actual impact of the asteroid or comet. Nuclear warfare is becoming a more scary and potential threat to the human race and this warfare could end in human extinction. We can prevent the threat of nuclear warfare by increasing good international relations. In 200-250 words, explain what biodiversity is. Biodiversity is the amount of variation of organisms on the earth. I live in Bucks County, PA and the types of biodiversity in my area would include deer, birds, bats, and household and farm animals. Our biodiversity lacks with seawater animals because we do not live near an ocean. One reason biodiversity is important because anthropocentric reasons, which means us humans use the animals for our own personal needs, like food and medicine. However, there is another reason called ecocentric, which is just the general happiness of humans to know that animals are safe and the biodiversity is thriving. Since we live in a world that is more selfish, I feel that more people are worried about biodiversity because of anthropocentric reasons; I think ethically we should consider the ecocentric reasons too but a majority of people are more concerned with their needs. This relates to the threats of biodiversity, which names the human population as one reason biodiversity is not safe. There are a lot of other reasons as to why biodiversity is threatened. The acronym H.I.P.P.O stands for Habitat Loss, Invasive Species, Pollution, Human Population, and Overharvesting, which are the five top threats. It is important to keep these in mind when we leave trash on the street, or change around animal habitats because we do not want to be even more of a harm. Pick an event from somewhere around the world that affected biodiversity. Explain it is 200-250 words. The event I picked was the BP gas leak in the Gulf of Mexico that started on April 20, 2010. Not only did this pollute the environment, we (the human population) damaged so many animals’ homes. Almost six years ago, BP’s Deepwater Horizon station blew up which killed 11 people and released more than 200 million gallons of oil in the Gulf. While workers tried to stop the leak for over three months, over 2 million gallons of toxic dispersants were sprayed in the water, which ended up causing more damage to the biodiversity in the Gulf. Endangered whales and dolphins were affected by this drastically, and even destroyed the efforts of trying to recover the brown pelican, which are now extinct. Sharks, fish, turtles, and other marine animals were seen migrating to shallow waters, which disrupted other species because they were considered invasive because they lost their normal habitat. Even though BP did not purposely release all this oil into the ocean, it is similar to the effects the Amazon Rainforest is suffering because of the loss of space the animals have to roam. Looking into the aftermath of the BP oil spill, it seems as if environmental companies sued BP so that devastations like this never happen again; legally, we can continue to drill for oil in the ocean. Morally, we should have more laws in place so we do not destroy biodiversity again. As stated in the question, there are many threats to biodiversity today. The largest and most common threats are represented by the acronym, HIPPO. HIPPO stands for Habitat Loss, Invasive Species, Pollution, Human Population, and Overharvesting. The first threat within the acronym is habitat loss. Habitat loss happens when an area in the environment is converted from usable to unusable. 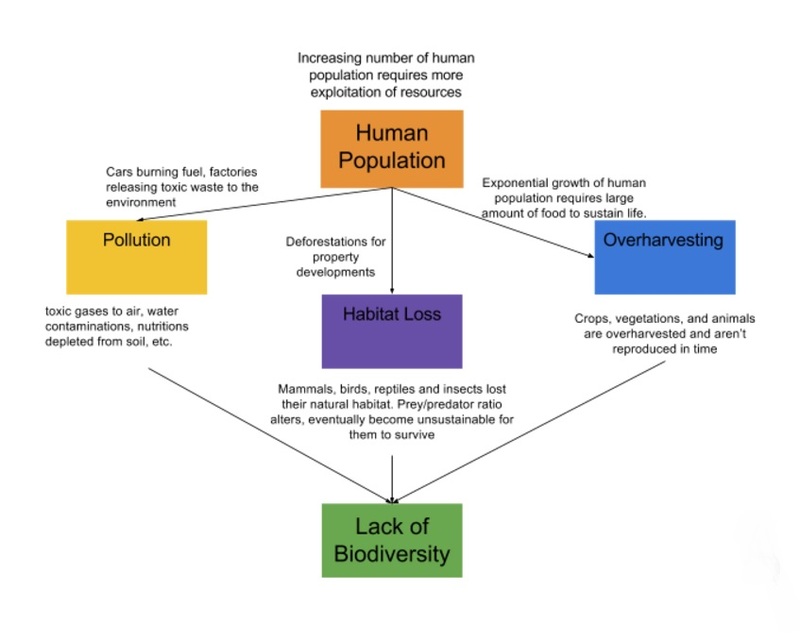 As stated within the module, the causes of habitat loss are industrial activities, agriculture, aquaculture, mining, deforestation, and water extraction. Invasive Species are the next concern. When a new animal, plant, or microbe enter a new area, it can affect others within its habitat. If the new species brings in an unfamiliar disease, competition for food, or just disrupt the other species it could potentially kill others. Pollution is next. Chemicals that are immersed into the atmosphere are very deadly for species within the area. The discharge of toxic synthetic chemicals and heavy metals are harmful and lead to extinctions as well. Up next is the human population. Human Population also has an impact. The higher the human population gets, the less resources there are for other species. The last one is overharvesting. Overharvesting includes things like hunting, fishing and gathering. When people over-fish, they could potentially be putting a type of fish at risk of extinction. The area I am choosing to talk about is Australia. I would have used my hometown but that would have been a little difficult. The environmental changes in Australia have been going on for thousands of years. Indigenous people have been interacting within Australia’s environment for tens of thousands of years. This has been very harmful to the course of evolution. The concept that I plan to bring into this discussion is the concept of sustainability. If the interaction of indigenous people with the country was harming evolution of some species, then the sustainability of those species was slowly diminishing before they went extinct or left the area. There has also been a large loss of habitat which directly relates to the the HIPPO concept of biodiversity. 75% of rainforests have been lost. Along with the rainforests, 50% of all forests have been lost. Coastal wetlands, temperate woodlands, and several grasslands have all been lost as well. Among these habitats that are being lost, there are several animals and plants that are under major threat. There are extinct, extinct in the wild, critically endangered, endangered, vulnerable, and conservation dependent species within the country of Australia. To prevent some of these things from happening, we can limit the amount of expansion of the human population and let some of the habitats thrive. By grouping the human population together, it will leave for more areas of vegetation and animals to live. 1) Discuss the why endangered and extinct animals matter to our ecosystems (150-200 words). Along with that, as far as it affects humans, it has a huge affect on the economic systems of numerous regions. The whale watching industry generated $2 billion dollars in revenue during 2012. Along with that, each year it creates over five thousand jobs. This is a way that whale watching, when done in their environment is both healthy for their space, as well as our economy. Choose whether you think biodiversity matters more for anthropocentric reasons or ecocentric reasons and use information from the module to support your answer. 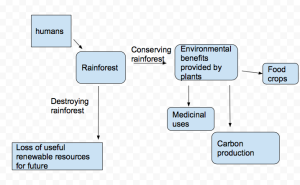 Then, create a system diagram that shows how humans impact rainforests, specifically the deforestation in the Amazon Rainforest..
As much as I would like for biodiversity to matter more for ecocentric reasons, I really believe it matters more for anthropocentric reasons. With the advancement in medicine, there are a lot of regions that contain lifeforms for medicinal purposes. Plants and animals are constantly being identified that provide humans with sources of food and other uses. Scientists are always learning about new species and our knowledge of biodiversity is constantly increasing. I think that biodiversity really impacts how we live our lives as humans. With technological advancements, countries that aren’t as biodiverse are able to get the benefits of countries that have more biodiversity. Other anthropocentric reasons for why biodiversity matters include plants and animals purifying water and air, pollinating crops, and cycling nutrients. If we didn’t have such a biodiverse climate and atmosphere, we would not be able to live the way we do. That makes me wonder if we will be able to maintain this biodiversity with the way people are living. We are already seeing negative effects through deforestation and overfishing and that may extend to other areas of biodiversity as well. Below is the link to my diagram. Imagine a new piece of land containing a rainforest has been discovered. You, being the scholar that you are, are in charge of its fate. Upon further inspection of this new land you discover a group of natives who are living off its resources. Other countries have taken interest in this new land as well and wish to become trading partners, but you worry about the loss of nature (and the newly found newt species on that land) in all the industrialization. Knowing what you know now about conservation and biodiversity, what is your next step in preserving and growing the land, the people, the newts, and why? Be sure to include thoughts about the levels of protection, how it will be enforced, ethical issues that may arise, etc. Think of the consequences! – Feel free to include a flow chart or describe the chain of effects (derived from your choices). Knowing what I know now, I would most likely try to find a compromise between the people and the land so that both may thrive. The category of protection I would most likely choose for this new land would be Category 2. I find that Category 2, National Parks, is a good compromise between protecting the environment with allowing the people to live their lives accordingly. Other categories such as Category 1 are too limiting of a status for the whole land on human interaction and would not be suitable for a new land trying to grow their economy. The best solution in my opinion would be to have the land be a mix of different levels of protection. The problem with Category 2 protection is that it is hard to enforce. In terms of enforcement, one must look at the ethics as well; anthropocentrism versus ecocentrism. Since I am taking a neutral stance so that both may live together, I will put some of the natives to serve as “Park Rangers” as they would know the land and its inhabitants best. This way, we will be sure to not intrude on the newts but also be able to encourage a growth of economy. By having the natives serve as “mediators” in a sense, a sense of balance could be achieved without having outside forces skew the perceptions. 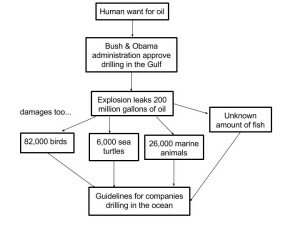 Having foreigners become too involved with regulating the land and its processes has the possibility to lead to a more anthropocentric stance as there would be much more chance to make money off of it with the interested trading countries; having someone who understands the animals as well as they way of the people would be the best way to go, in this sense. Certain sections shall be restricted to an almost similar Category 1 status where no outside contact will be allowed in order to not disturb the natural cycle. Sections left outside Categories 1 and 2 will be open for economy growth and trading purposes. The sections and how they are divided shall be divided according to the natives (as where the newts are located must be taken into account, as well as “sacred” sites to avoid digging up, etc.) so that everyone is content with the new agreement. Construct a system diagram relating what you learned about biodiversity and the case study done in the Amazon rainforest. 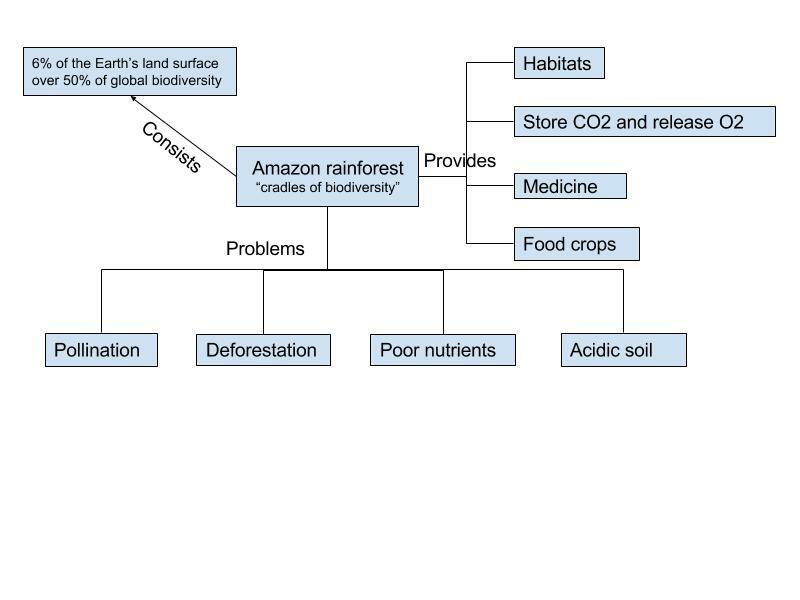 In 150-200 words describe the diagram you made in question 1 and how biodiversity can be related to the Amazon rainforest. In 175-300 words describe biodiversity in your own hometown and some events that might or have affected it. Biodiversity and the Amazon rainforest are very closely intertwined. The Amazon rainforest is the largest rainforest in the world, producing many crops for export such as bananas, pineapples, and sugarcane. Rainforests are often called the “lungs of the planet” because of their large intakes of carbon dioxide and larger releases of oxygen. Rainforests are also called the “cradles of biodiversity” as there are home to 50% of the World’s biodiversity. It is because of this that issues such as deforestation and clear cutting are such a problem, not only for sustainability and renewable resources, but also the life of biodiversity. Deforestation occurs in the Amazon rainforest through processes such as mining or construction of new roads. However, it can also be caused by poor farmers accepting to clear land in order to farm it. Farming does not last very long in one area though. This is because the soil is not very fertile. Cutting down the trees is also leaving many animals without homes and as a result, there is a lack then of biodiversity. Farmers also hunt the remaining forested areas, furthering the lack of biodiversity in the vast area. 3.There is quite a lot of biodiversity in my hometown. My home in Snow Shoe, PA is surrounded by the outdoors and is home to many species of animals. Over last few years there has been a disturbance however, in the amount of untouched land. Many gas wells have popped up in the area, which disrupts not only wildlife, but also the water systems. In the past, there also used to be a shallow coal mine close to my home. Mining very much disrupted the wildlife in the area for some time. Now, many years later, the land has been reclaimed by the state. Although this land is back to the way it was before the mining took place, it still is just a wide open field with much fewer trees than before as well as loss of habitat. Another activity that many would argue contributes to a lack biodiversity in the area is hunting. Where I come from everybody hunts as a way to fill their freezer and feed their family. Although some would say this decreases the population of certain species, it is another means of controlling the population as well as a food source. For instance, my county participates in a yearly coyote hunt. This is an organized hunt, but while others may see it as a cruel way of hunting for sport, its larger, original purpose was to help control the overwhelming population in the area. Part I: How biodiversity can vary with respect to different climate regions. Part II: Explain the difference between extinct and endangered species. Part III: Touch on where extinction of species are more likely to occur (from a geopolitical standpoint). Part I: As was mentioned in the module, biodiversity can vary immensely depending on where your location is among the planet. You will find more biodiversity along the equatorial axis of the Earth, as the tropics have consistent weather patterns year round. For instance, tropical and subtropical regions, such as far southern Florida and the Florida Keys, have the same climate year round: Very warm and humid. It does not get excruciatingly hot due to the influence of air off the oceans (believe it or not, 90+ degree Fahrenheit days are rare for the city of Miami!). Because the climate is “stable” year round, a diverse network of species are able to thrive, from mammals, reptiles, amphibians, and so on. Now if you were to travel into the polar regions, such as the remote town of Nome, Alaska, you will likely find minimal biodiversity as the climate is harsh. Usually dry, extremely cold, and exposed to all sunlight and darkness for season portions of the year, only the toughest of species (plant and animal) are able to survive, such as the Alaskan wolf, Russian snow geese, polar bears, etc. Part II: Extinct animals, such as the recent black rhinoceros, are animals that no longer exist on the planet. Whether or not it was from natural extinction, or influence of man by over harvesting, destroying land, etc., they will never return. Endangered animals are categorized as species that are on the verge of extinction. A very recent example of endangered species are located near my home area in the Delaware Bay. This species is the horseshoe crab. At one point, decades ago, the species was on the endangered list and very, very close to extinction. However, after strict implementations for the conversation of wildlife, the population has increased one hundred fold, and there are over 1,000,000 horseshoe crab in the Delaware Bay. It is home to the highest concentration of horseshoe crab in the world. Part III: Tying Part II into this section, I think biodiversity has a greater chance of becoming extinct from a human influence perspective where ecocentric points of view lack, as well as government regulations. The United States has done a pretty good job when it comes to animal conversation, as protecting wild life is one of the key interests for our economy (such as hunting, etc.). Other nations; however, that may not have harvesting and/or hunting regulations, such as the illegal whale hunting in the southern Pacific, may result in a decrease in species population, which may eventually become endangered or extinct. I think that while hunting, fishing, and harvesting food is important, it is exceptionally important to not over harvest and consume juvenile life. By not harvesting juvenile life, animal species will be able to reproduce, keeping the food web and biodiversity network stable. Spatial scale refers to any sort of physical space that biodiversity, or the variation and richness of organisms, can take up. Spatial approaches can include how the species fit in the specified area, how diverse they are, and how they depend upon each other. Anthropocentric reasons for valuing the system of biodiversity refers to the reasons why the biodiversity is of value to humanity. Understanding the biodiversity by means of genetic, species, and ecosystem diversities in an area that coincides with human populations is important to us as far as access to resources and ecosystem services goes. Medicine, food and water purification are some examples to anthropocentric reasons. Ecocentric values, or nature-centered reasons for valuing biodiversity relate to spatial scales in that it is important to preserve ecosystems in certain parts of the world in order to preserve how ecosystems work together. Temporal scales relate to chronological factors in biodiversity. This scale factor is especially important in understanding the progression of biodiversity and the future of living organisms. Antropocentric reasons for valuing biodiversity is especially important when it comes to preserving future species, including humans. Approximately 99.9% of species that have ever existed on earth are extinct. Understanding how humans now play a significant role in both destroying and preserving our resources is crucial in our short timeline. Ecocentric reasons for appreciating biodiversity tie into understanding the value of preserving every facet of earth, whether or not humans are directly affected or not. It is important to allow species and ecosystems to thrive for future generations to enjoy, and most importantly, for a healthy planet. Create a system diagram showing the relationship between spatial and temporal scales, with both anthropocentric and ecocentric approaches as they relate to question #1. When we built my house in 2001, the whole neighborhood was a swamp. I would catch tadpoles and frogs with my friends by my house. As more people started building houses, the swampy areas got drained to allow for construction. As funny as it is to recall, at 6-years-old, I made picket signs out of construction paper and popsicle sticks and marched around my yard in protest whenever the construction workers worked on the land. It was a kid’s nightmare- the best play area being ruined, and innocent frogs being killed. The neighborhood is now almost all built-up, and it is bone dry with not a single swamp. I forgot how something on such a small scale- only a few acres, had actually caused so much damage. I haven’t seen a frog or a tadpole in my neighborhood since 2004. It’s sad to say I was right at 6 years old. The concerning part is that some predatory species followed suit. Since the frogs’ habitats have been destroyed, several types of snakes and birds that preyed on the frogs have disappeared as well. The species biodiversity had a rapid habitat loss in a neighborhood that builds 5-10 houses per year. Human population and pollution are additional factors that affected the wildlife. Trash and chemical pollutants destroyed the remaining areas rich in biodiversity in my neighborhood. I can limit further biodiversity loss by protecting the woods in my backyard from being cut down or polluted.